There was pie and plenty more too, but in my mind, the dining theme of this trip was very old-fashioned supper-club-type steakhouses. My wife and I went to four of them in five nights. While that was the dining them, the visual from the trip that will remain with me for a long time to come is of cornfields. 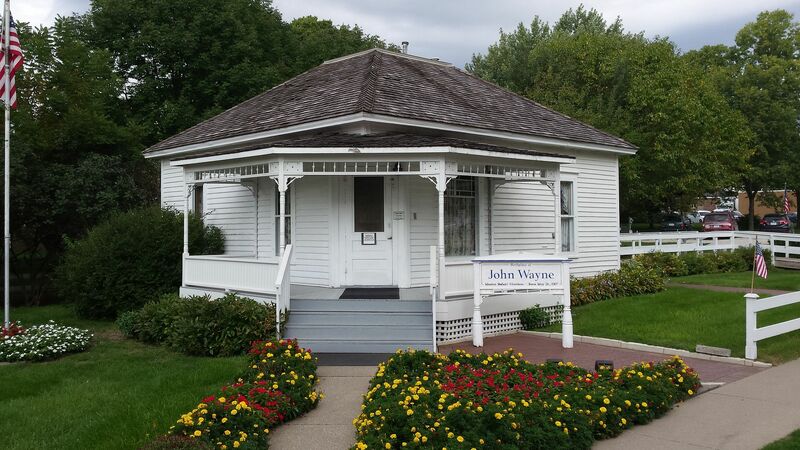 I see why Wandering Jew put them in the title of his last Iowa trip report. We flew into Des Moines and used it as our base for the first couple days of the trip, but each time we left it, we almost immediately came to cornfields. And they were everywhere, in every direction for as far at the eye could see, with just periodic small towns, some with Main Streets, to break the string of farms. I would guess cornfields take up a very hefty percentage of the land in Iowa, and at least Eastern Nebraska. 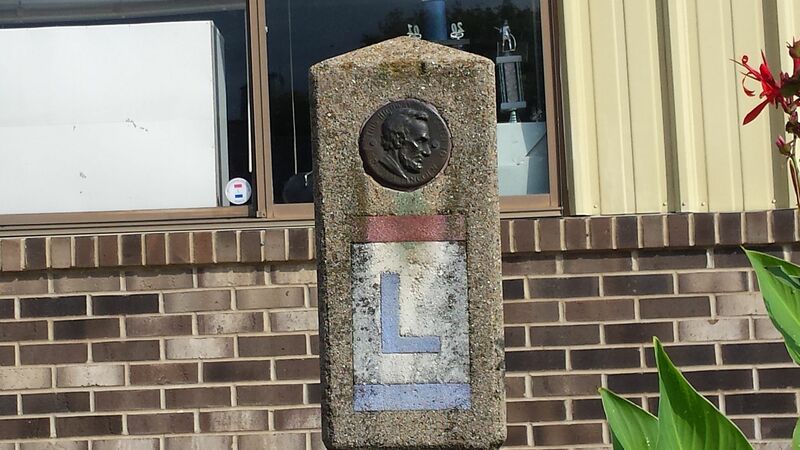 Lincoln was as far west as we got. For the most part, we took older highways and roads and not the interstates, at least once we got more than a couple miles outside of Des Moines. I'll start posting details tomorrow, but for my first photo, I'll go with the relish tray at the Redwood Steakhouse, which I'll return to when I get to that part of the report. It was our last meal of the trip other than a sandwich at the airport the next morning. 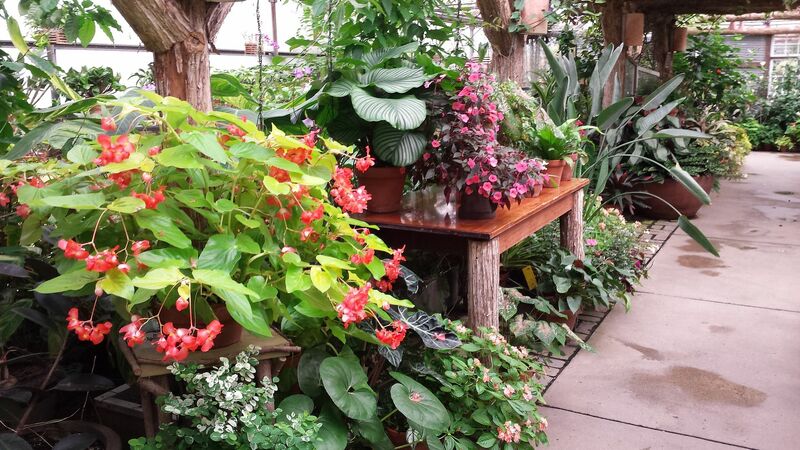 I had been awed by the photo of it on this site for years and was not disappointed by how spectacular it is in appearance and variety when it arrived. * The cottage cheese was offered as a replacement for the salad that I asked to skip. I don't like cottage cheese, but my wife will eat it. It was getting to that point at the end of the trip where I was very full and didn't want to eat a lot before the main course arrived. I really like your trip reports so I'm looking forward to this. I love relish trays and like both cottage cheese and green salad but I can certainly you not wanting to waste stomach space on them when you're getting full. I really admire the way some people on the forums can really eat on a trip but I can't seem to do it anymore and once I really stuff, I really don't want much for a couple of days. Funny that I drive past cornfields all the time and never give it a second thought. I'm looking forward to your report. I hope you enjoyed the simple traditional foods you were served. 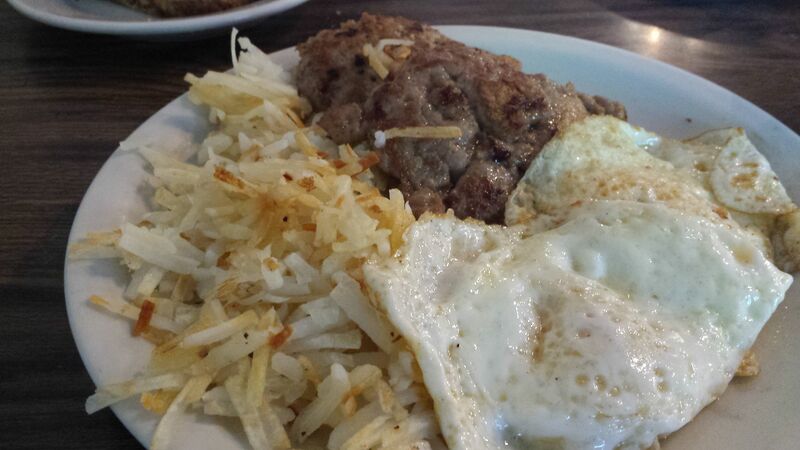 I enjoy simple traditional foods from Pita Plus restaurant. So yummy! That's one comprehensive relish tray, but I'm not sure about the paper cups. I can't recall if I've ever seen them used this way before. Redwood is less than 5 miles from I-80 so it might be a possibility for Mrs. C and I next year. I've been told privately and now see it on here that cornfield is one word. I'm not from around those parts! Mim …. I hear you. I have mentioned on here before that I have a small appetite by roadfood standards and could never keep up with a lot of the regulars on here. By the way, the significance of the relish tray for me is completely nostalgic and personal and has nothing to do with the food, most of which I didn't touch. I still have memories of my grandparents taking us out to dinner regularly on Monday nights, because my grandfather took Mondays off from the auto repair shop/gas station that he owned. This was in the late 60s and early 70s and one of the places he would take us to regularly had a very nice room and I vaguely recall getting a plate of raw vegetables at the start of the meal. It never occurred to me to give the plate a name, but when I started reading about these places on here in the late 90s, I knew that what we were getting in those days was a relish tray. The place is called the Buck Hotel and is still there, but it's been many years since it was the type of place that would serve a relish tray. It's something more modern at this point. 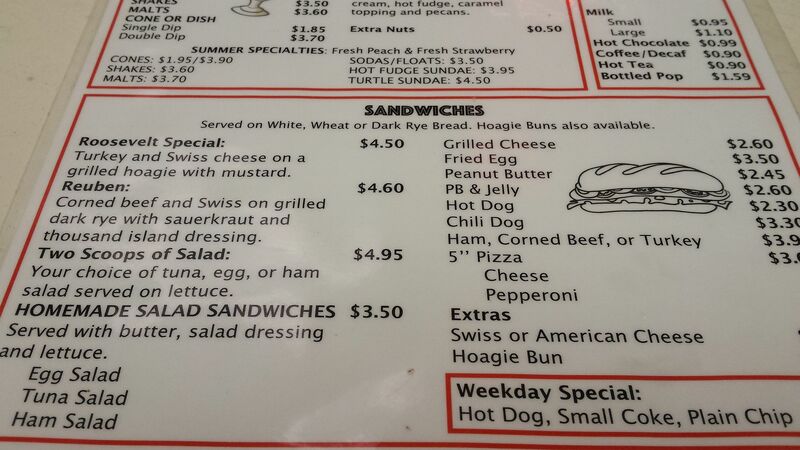 I haven't been there since I was a kid, but have looked at their menu online. 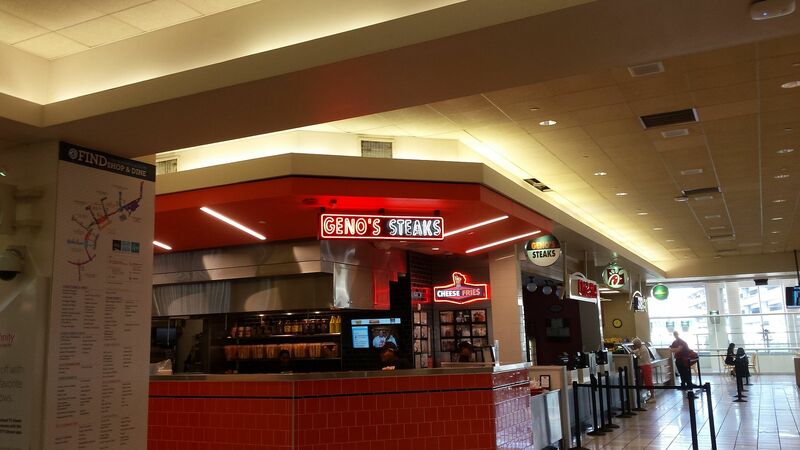 Before I get into the Iowa portion of the trip, I hadn't been in Philadelphia's airport in a while and noticed major changes, including some good new food stands. But enough of Pennsylvania. We flew into Des Moines and it was late enough for us to decide to remain near our hotel that first night. 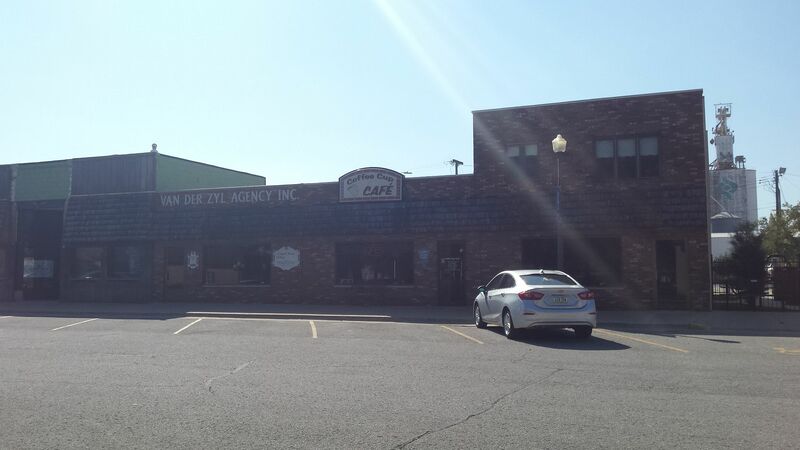 There weren't a lot of great options, but there was one quirky and fairly well-known (locally) place that we decided to try out. 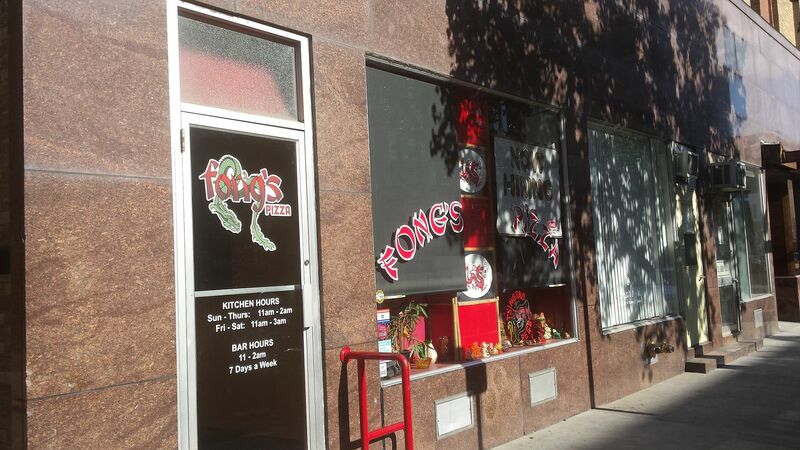 It's called Fong's Pizza. 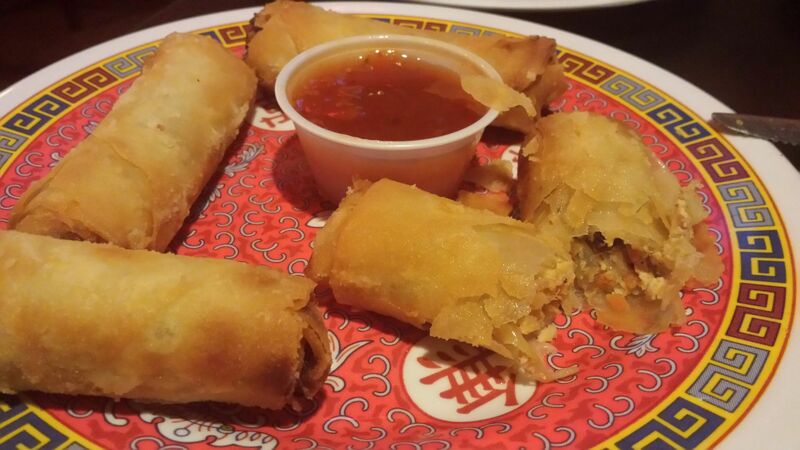 It's in what for years was the oldest Chinese restaurant in Des Moines. 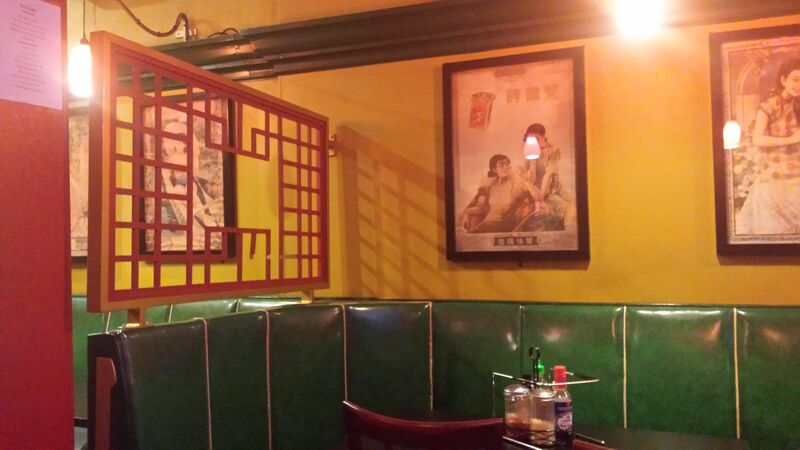 At some point after the Chinese restaurant went out of business, it was taken over by people who kept the classic décor, but changed the menu to something very unusual: Chinese pizza; meaning pizza crust topped with Chinese food. 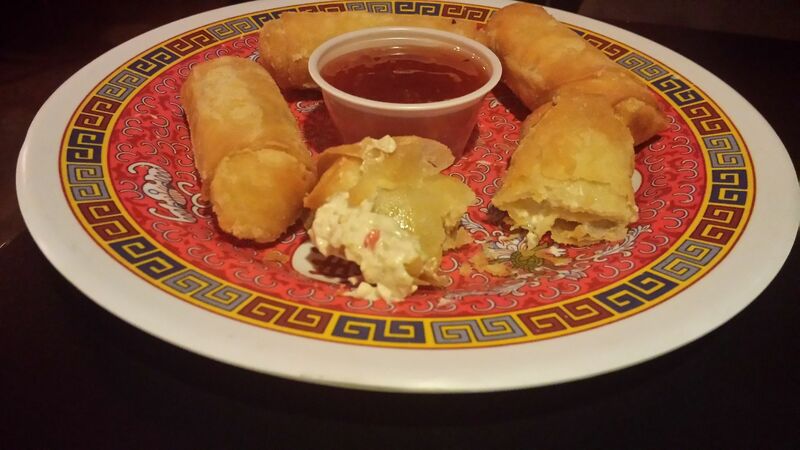 We went for General Tso's Chicken pizza and egg rolls and crab Rangoon for appetizers. I have fairly high standards for Chinese food after having lived in Philadelphia's Chinatown for eight years and wasn't nuts about any of the food I had at Fong's, but given the options within walking distance of the hotel, it was a decent experience for the uniqueness of the place. I knew I was just biding my time until the trip really got under way the following morning. 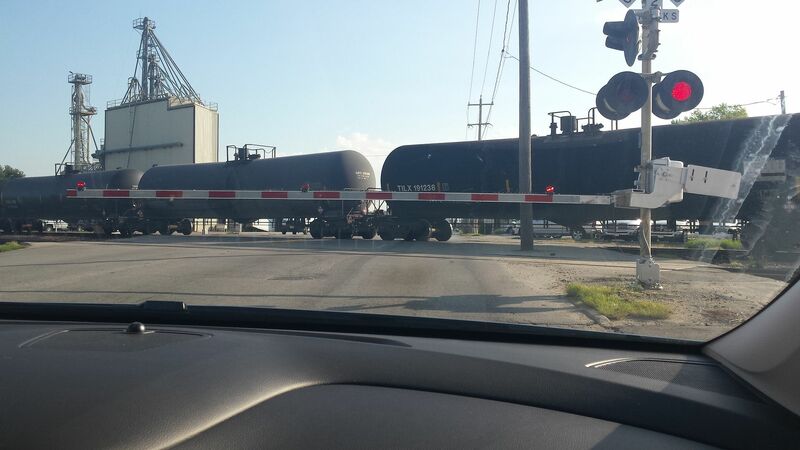 This train went on for a while. 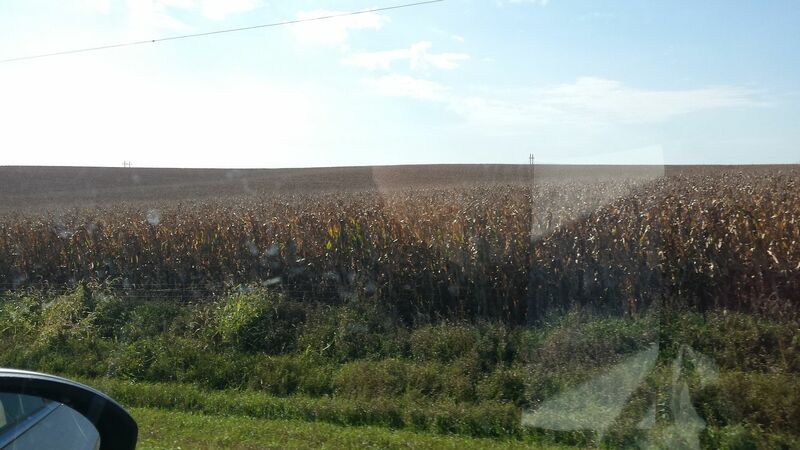 Then we caught our first glimpse of the previously-mentioned cornfields. 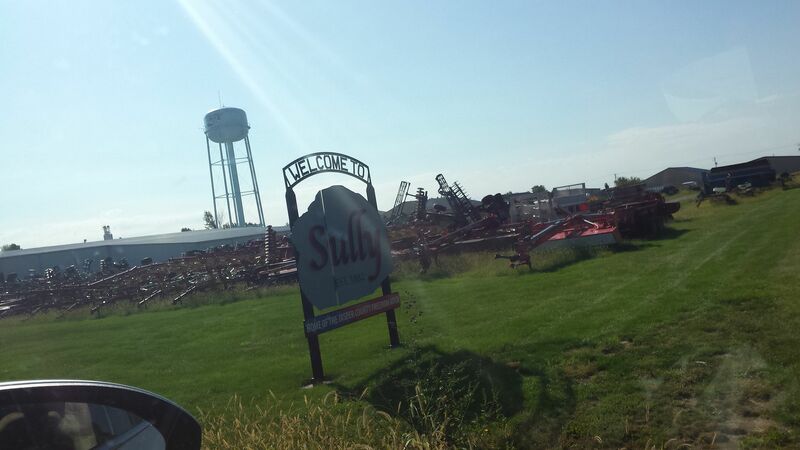 We finally made it to our first destination that morning: Sully, home of the Coffee Cup Café, which I was strongly urged to visit before leaving on this trip. I took the advice and was very glad I did. We arrived between the breakfast and lunch rushes and the moderate crowd that was there initially cleared out for the most part not long after we ordered our breakfast. My wife had a breakfast sandwich and I went with a basic breakfast plate of eggs, freshly made sausage patties and hash browns. It reminded me of the breakfasts I've had at the Summit Diner in Western PA, where they also make their own sausage patties. But we didn't drive through the cornfields for eggs. 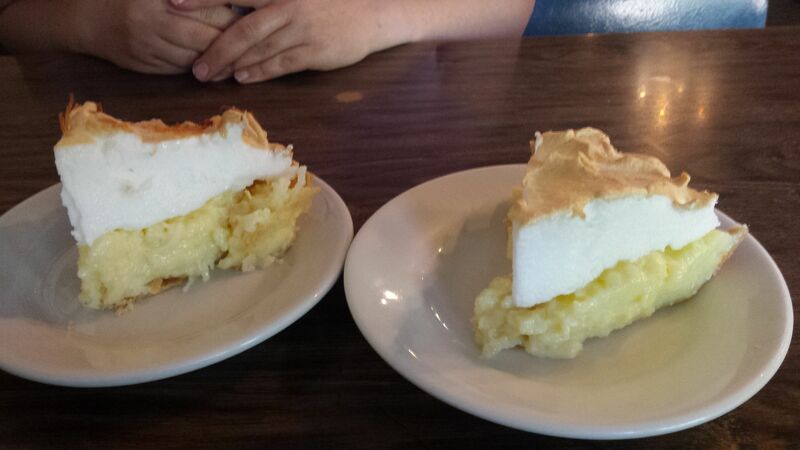 We were at the Coffee Cup to try their famous cream pies: banana and coconut. 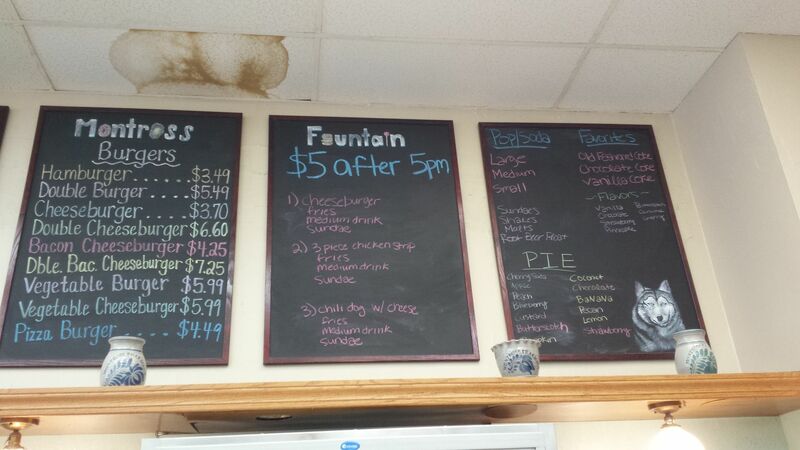 I was initially nervous when I looked at their pie board and only saw one flavor, which was a berry pie of some type. But when I asked, I was told they had both of the flavors I was interested in. We ordered a slice of each. The banana was unquestionably the best banana-cream pie I've had. 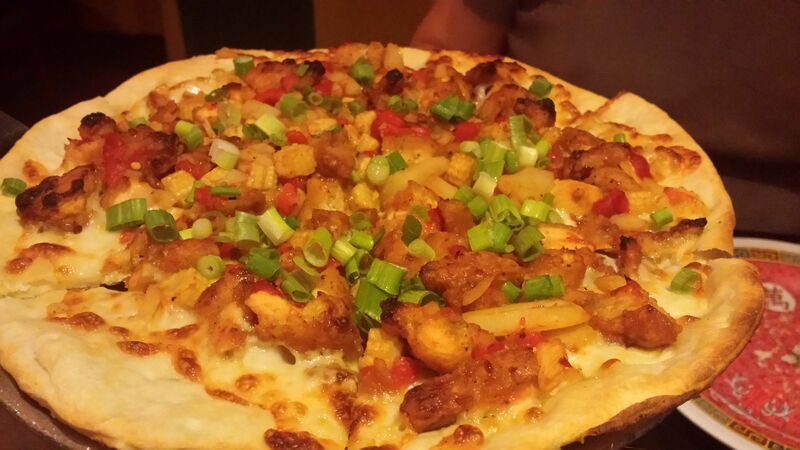 The coconut was also outstanding. 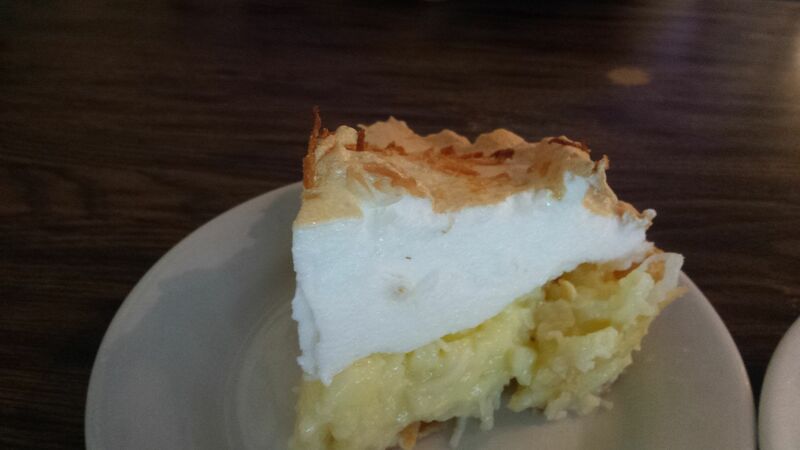 If I have one complaint about it, and it's strictly a matter of personal taste, I prefer the coconut flavor in coconut pie to be a little more subtle than it is at the Coffee Cup, where they must put a ton of coconut in there. It's a very strong flavor. The banana pie was equally strong in flavor, but that's a positive for me in the case of banana. We also got our first inkling of our nice Iowans are at the Coffee Cup both from the two servers we dealt with an an older couple who stopped to talk to us about the pie on their way out. I heard them also order banana and he asked for a slice of the berry pie to take home and have with ice cream later. 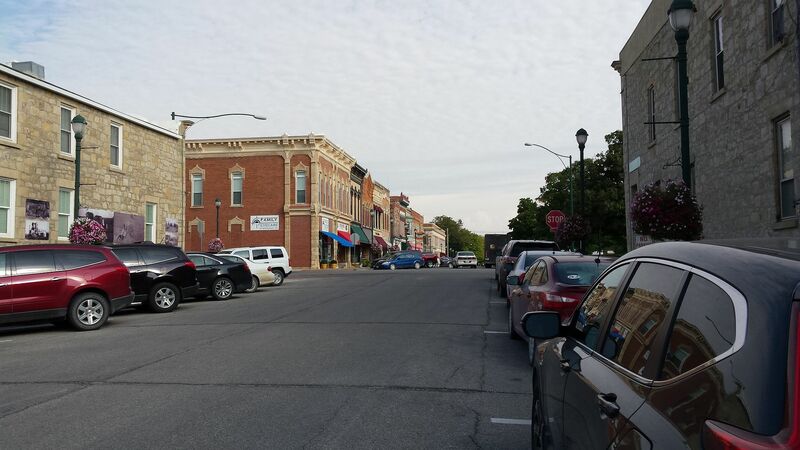 We then drove a little south past more cornfields on our way to what is one of the most impressive small towns my wife and I have been to in our travels around the country: Pella, IA. 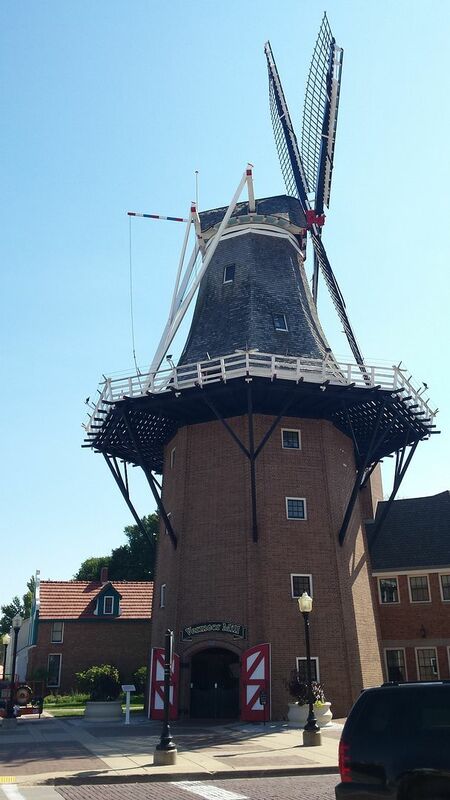 Pella was founded by Dutch immigrants and has a very strong Dutch theme with Dutch bakeries, a big windmill in the center of town and a hotel called the New Amsterdam with a man-made little canal flowing in front of it. 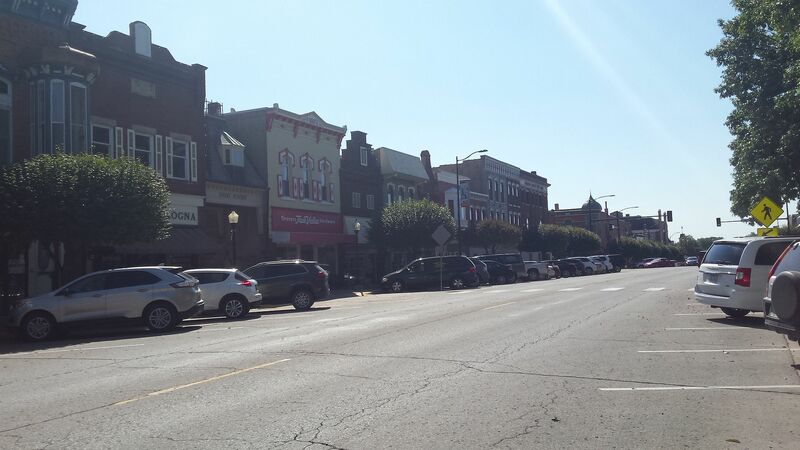 This town is really alive compared to most of the small towns I've been to in recent years. There is nothing at all indicating any sort of decline from past glory days, as is too often the case. I've probably mentioned in past trip reports that my wife and I are trying to visit as many state capitols as we can get to. 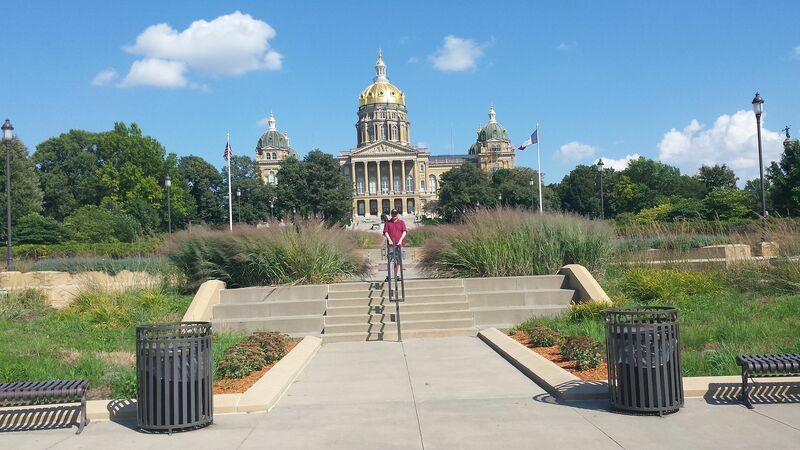 Here I am in front of the one in Des Moines. 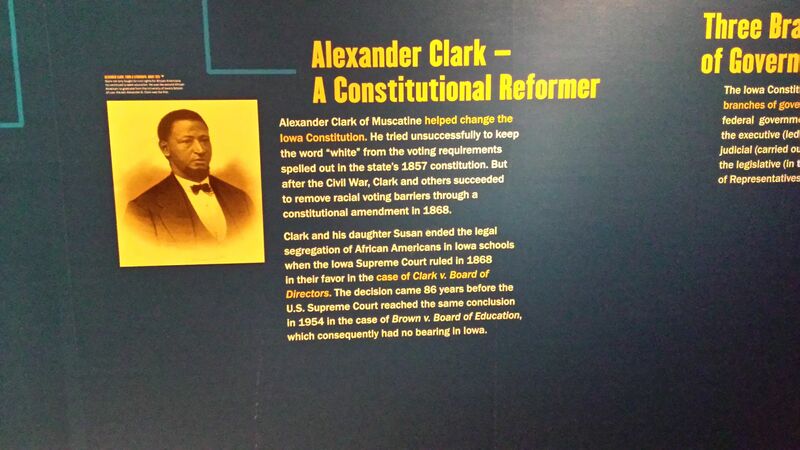 And as is the case in a number of states, there is a state history museum near the capitol. A little later, it was time for dinner, which would be at the first of the four steakhouses we visited: Jesse's Embers. As was the case in all four cases, we arrived shortly after opening, which gave me a chance to photograph at least part of the dining room without having to worry about including a lot of other diners. After our salads, my wife had the pork chop and I had the ribeye, although she was kind enough to cut off a piece of her chop for me to try. 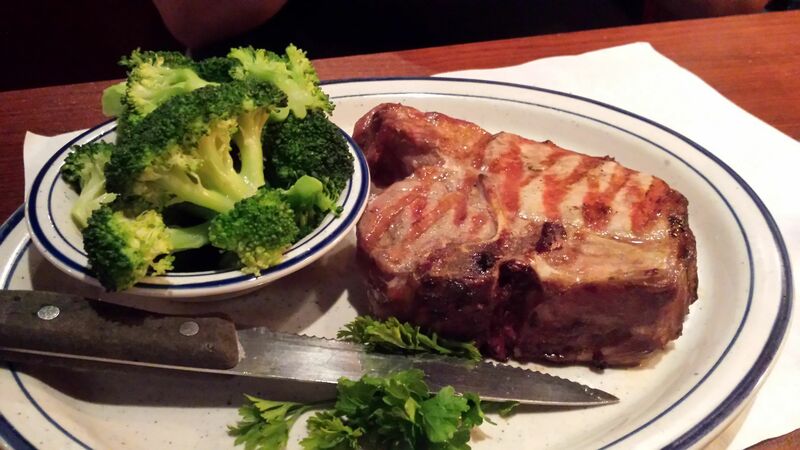 It was a very good pork chop, certainly not what I've been accustomed to in my region. There was more flavor and it was juicy. The ribeye was also good, and very thick. Great report. Thanks so much! 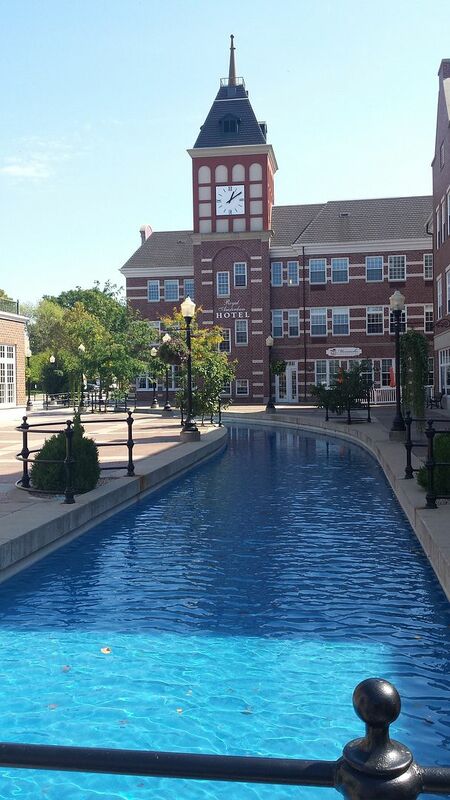 One thing working in Pella's favor is that it's the home of Central College, a highly respected private educational institution. 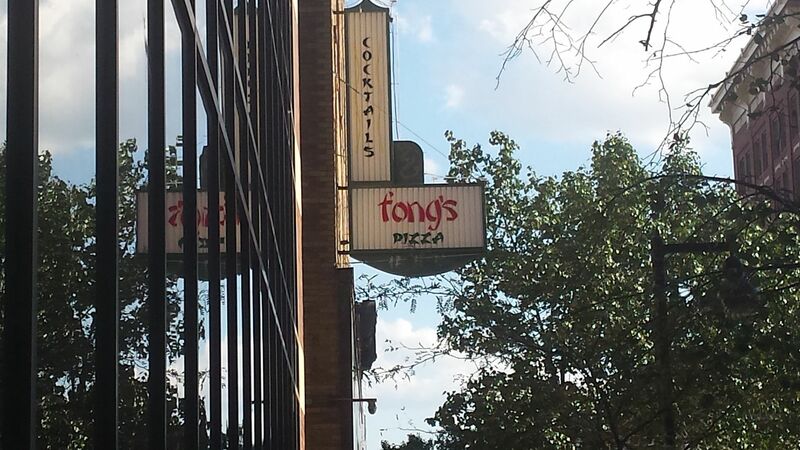 Glad you made it to Fong's Pizza. It's certainly a unique place! Wonderful start to your trip report. 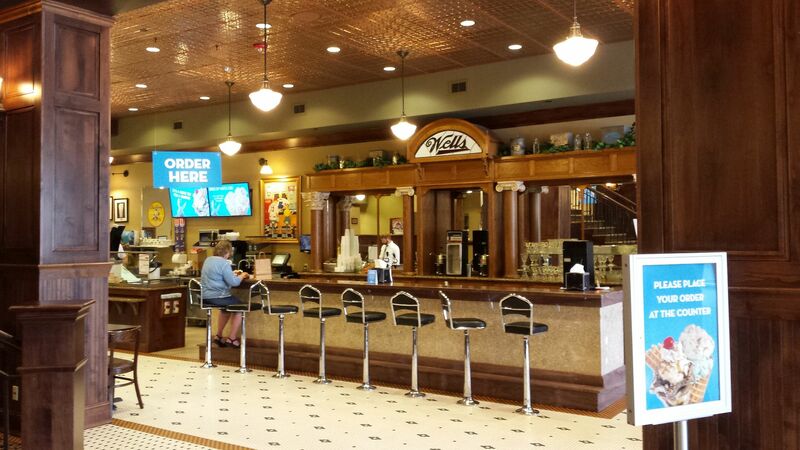 So glad that you liked the pies at Coffee Cup Café as much as you did. 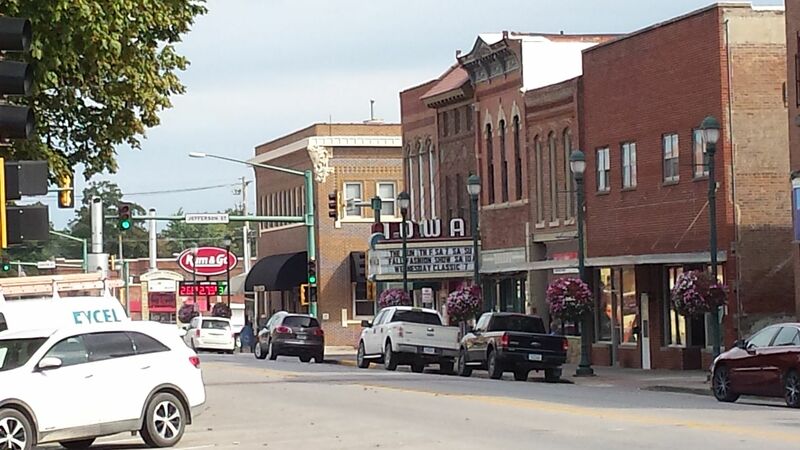 As many times as I have been to Pella, I have never seen that canal. Thanks for that info! Very much looking forward to more. This is a good report. I've never been to this part of the country before. Thanks for the comments. I always look forward to sharing these experiences with everyone on here. phlmaestro, Great start...thanks. When we moved to Des Moines in '94 Jesse's Embers was a frequent dining spot for us, as in those days, Des Moines had very few choices compared to today. Always packed. Thanks. While Jesse's was empty in the photo, that was right after it opened. By the time we left, the dining room was closer to full than empty, and this was a Monday night. I was happy to see that. 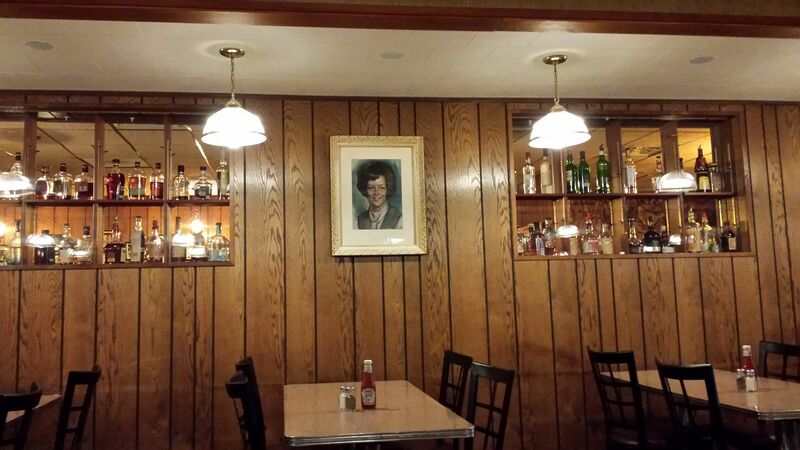 I forgot to mention that a man named Marty, who I'm pretty sure is the owner and Jesse's son or grandson because he told us his father took an old B&W photo of Des Moines that was hanging above our table, was extremely friendly. He was sitting and talking with friends of his in the next booth over when we arrived. By the time we left, he was busy helping the staff. 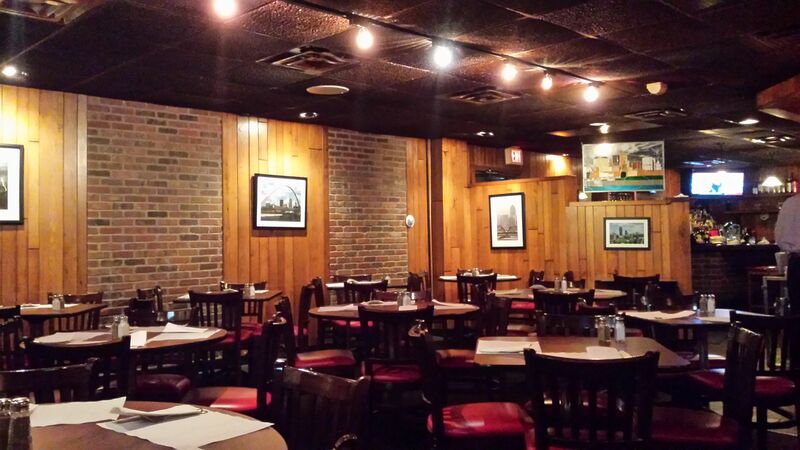 When we first arrived, Marty steered us to a corner booth that he said would be quiet. EDIT: I just read on another site that while Marty is one of the owners, but he is not related to the original owners. His parents owned another restaurant outside of Des Moines. 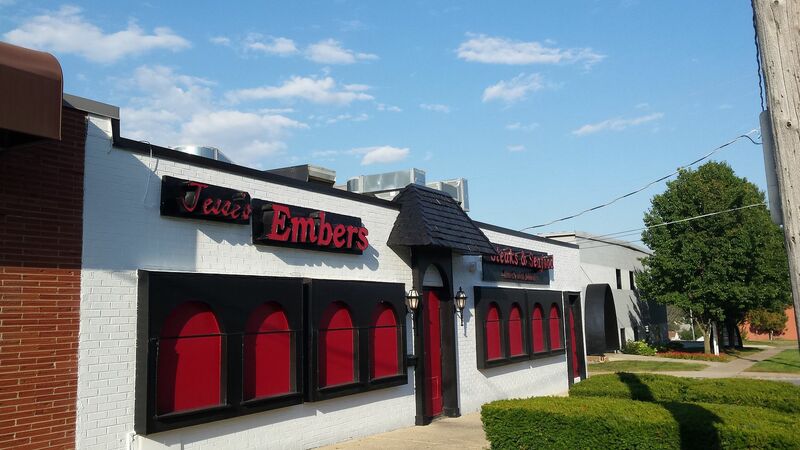 The original family sold Jesse's Embers a little over a decade ago. The newer owners seem to be doing a good job of keeping the place up from what we experienced. The next day, Tuesday, would be the last full day of the trip for which we didn't have a major dinner planned. I decided that with three straight nights at steakhouses still to come, I'd give my wife a break. 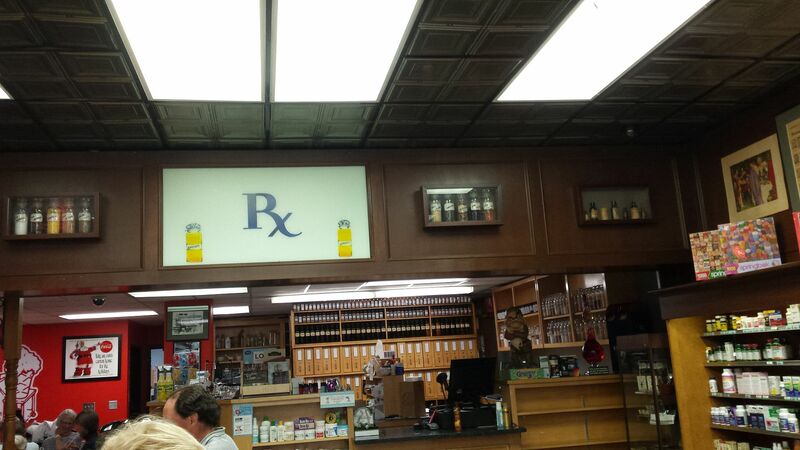 But those who have read some of my earlier trip reports may recall that I have a particular weakness for pharmacies with luncheonettes and soda fountains. I'd score twice this day in that regard. 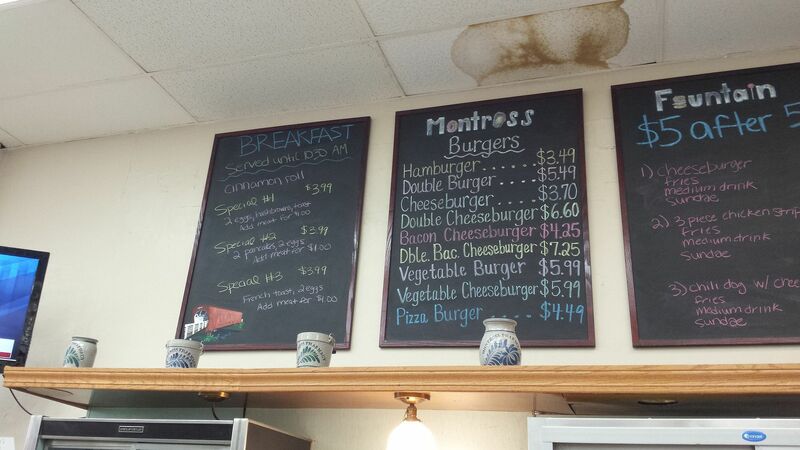 In the morning, with Des Moines still our base, we headed southwest to Winterset in Madison County of bridges fame. But we weren't there to look at bridges. 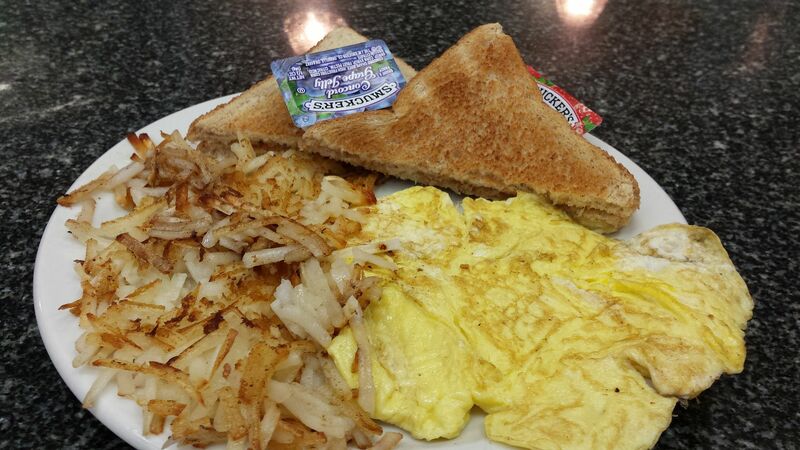 I'll get to our main reason for visiting Winterset shortly, but before we went to our destination, we had breakfast first. 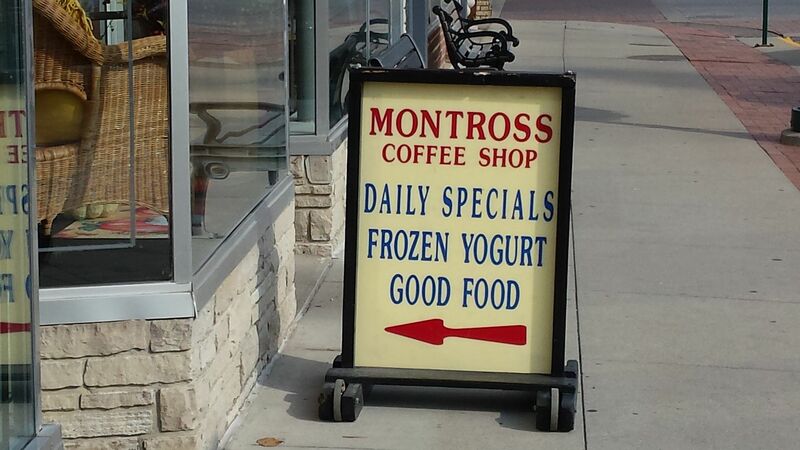 I wasn't sure I'd get to Winterset initially. 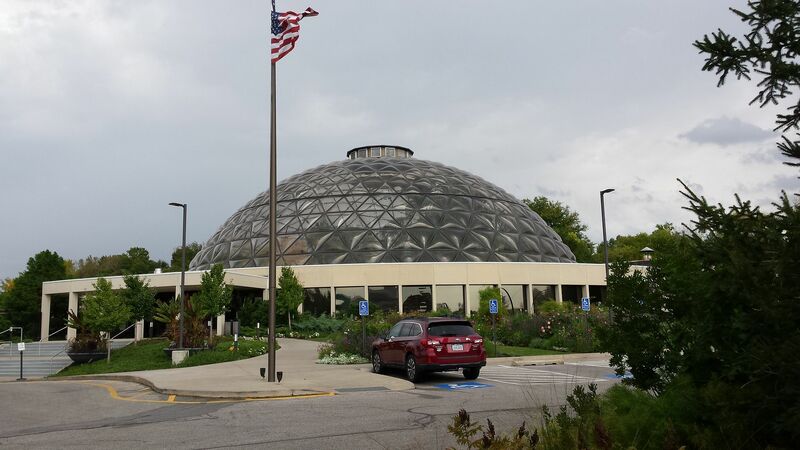 I had mentioned on another thread that we intended to drive to Decorah in far northwest Iowa, but we decided to cut that out because we already had a ton of time in the car scheduled and going to Decorah would add another close to half-day. 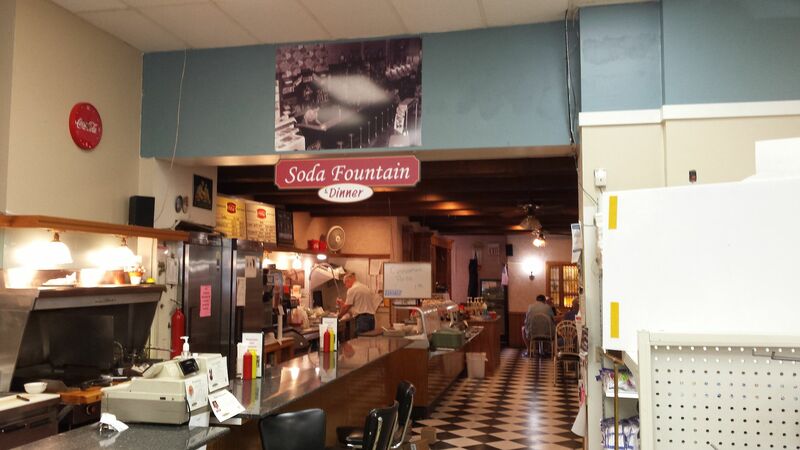 When we finally decided we were going to Winterset, I did a late search for restaurants in town and found that they have a pharmacy that serves all three meals, as well as having a soda fountain. We decided to have breakfast there. 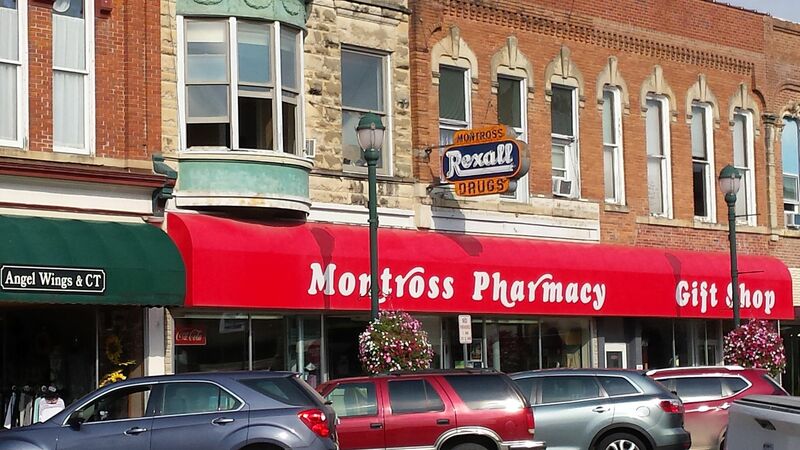 Winterset has a fairly nice downtown and the Montross Pharmacy is on First Avenue (as opposed to First Street, which is one block over …. not the greatest move by town planners IMO, although we had no problem finding it). 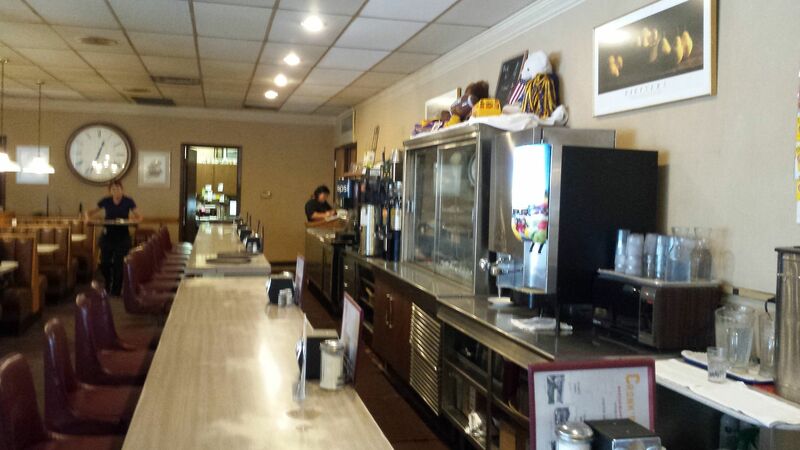 After walking through the front of the store, you come to both a breakfast/lunch counter and some tables in the rear. 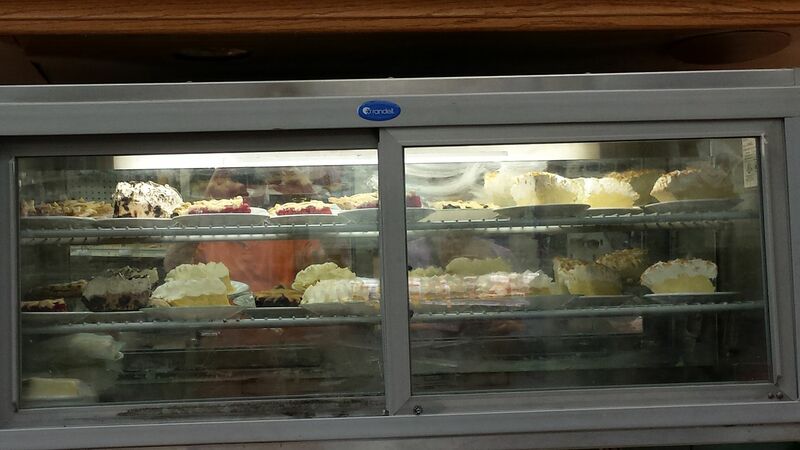 The area with tables is fairly nice as far as pharmacy luncheonettes go, but we sat at the counter, right in front of a pleasant surprise: a pie case that was full of slices of a number of flavors. It appeared that the topping on the cream pies was whipped cream rather than meringue. We had our breakfast first. 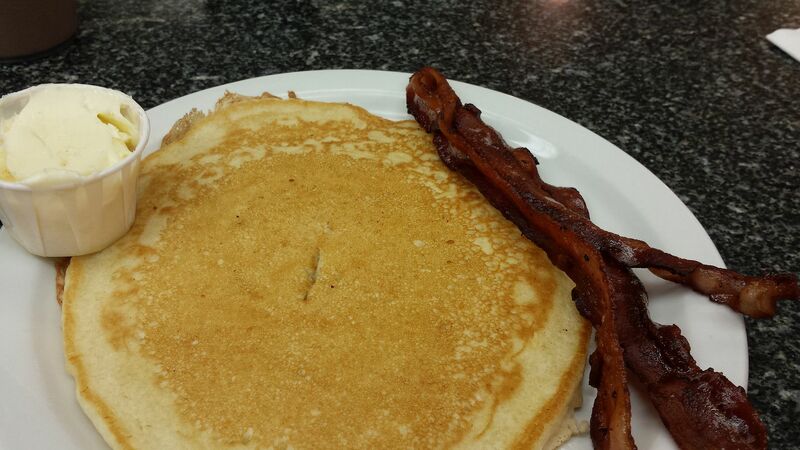 My wife had a basic breakfast plate without meat and I went for a pancake with bacon. The woman who took our order and made the breakfast asked if I wanted one or two pancakes. I'd have probably gone for two until I saw the pie. I ordered one, which turned out to be big, but not huge. It was also extremely good. One of the pie flavors on the board was butterscotch, and I'd wanted to try that for a while. Unfortunately, it turned out that they didn't have all of the flavors listed on the board, and butterscotch wasn't one that they did have. 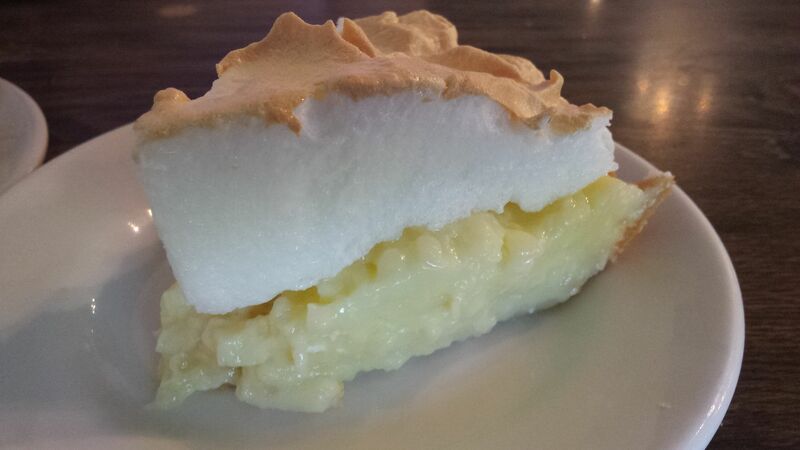 I wasn't in the mood for any other cream pie just a day after the great pie I had at the Coffee Cup. 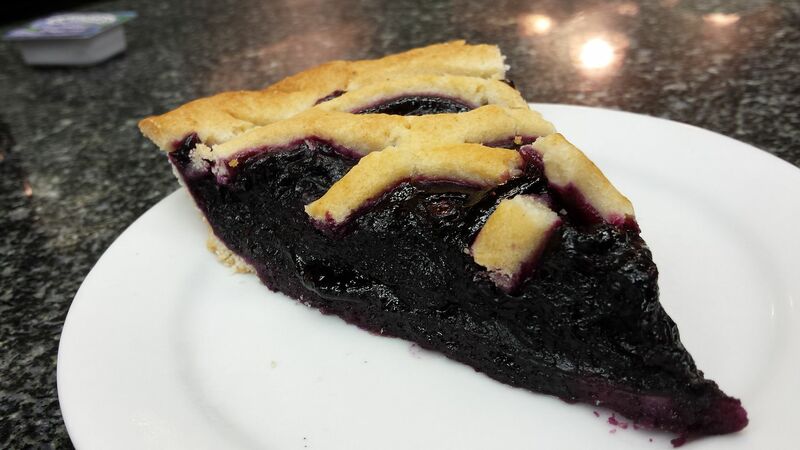 So I decided on fruit pie and opted for blueberry, which I had warmed up. The crust was nothing special, but the blueberry filling was full of either fresh or frozen blueberries and was very good. 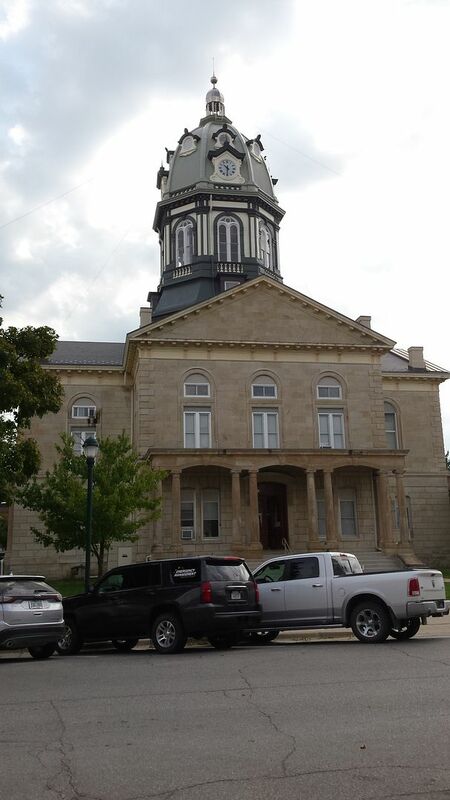 Winterset is a county seat and the courthouse was nearby. 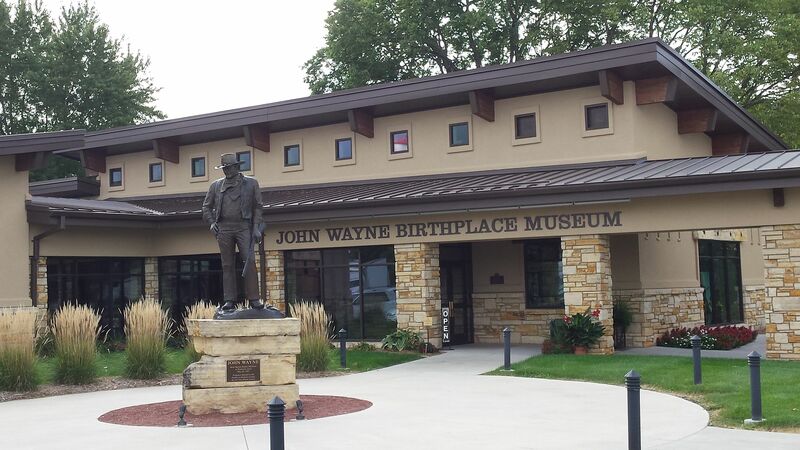 Our reason for going to Winterset was related to the fact that I've become a fan of Westerns in later years and the most famous Westerns movie star of them all is from there. 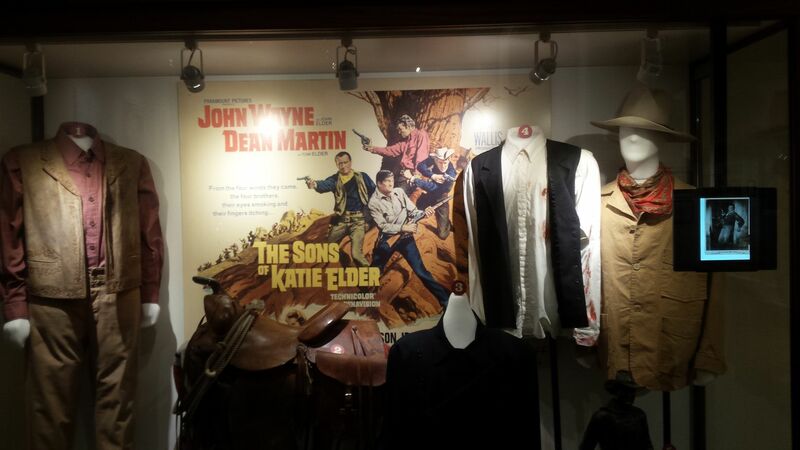 They've made a nice little museum for him where they show a biographical film. 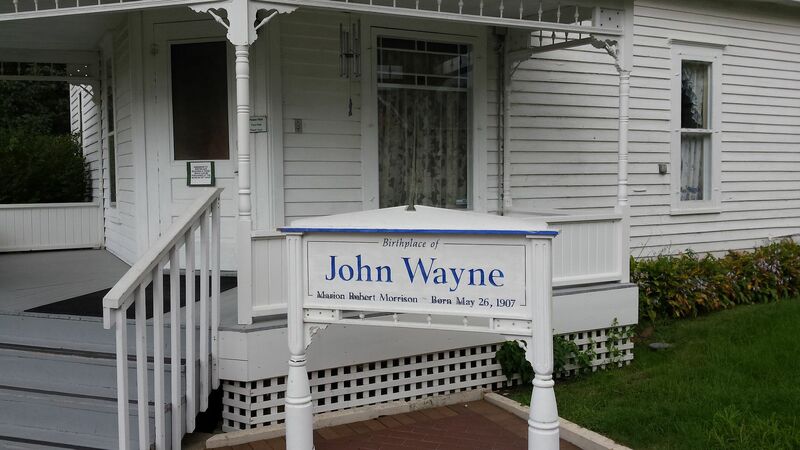 His birthplace is around the corner and can be entered for touring. 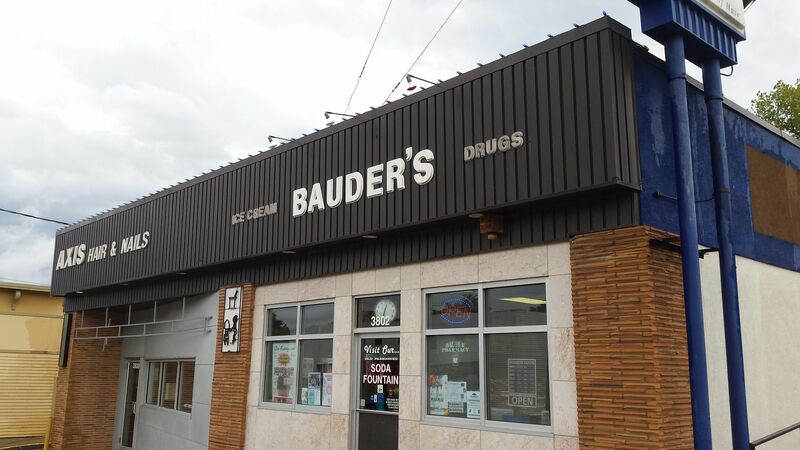 From Winterset, we drove back to Des Moines to visit a place that is just a few blocks up the road from Jesse's Embers: Bauder's Pharmacy. 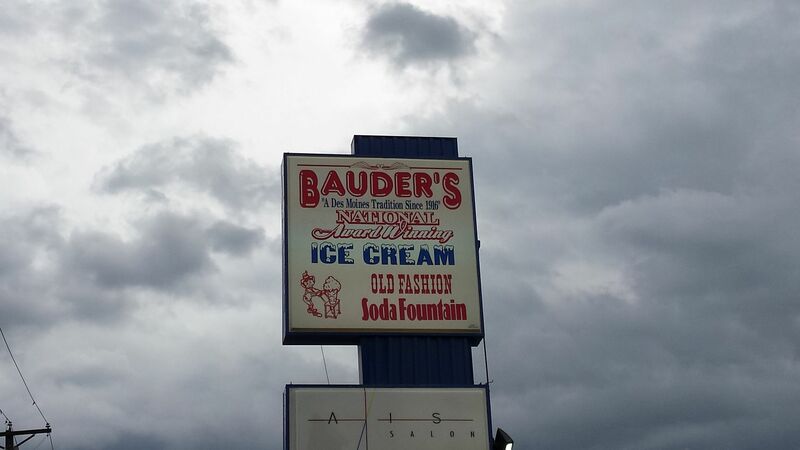 I had initially intended to have lunch at Bauder's, but it wasn't that long since our breakfast and my pie, and the main reason for being there was to have ice cream, so we skipped the sandwiches. They offer a few different flavors of what they call ice cream sandwiches and my wife ordered one that goes by cinnamon apple crisp. 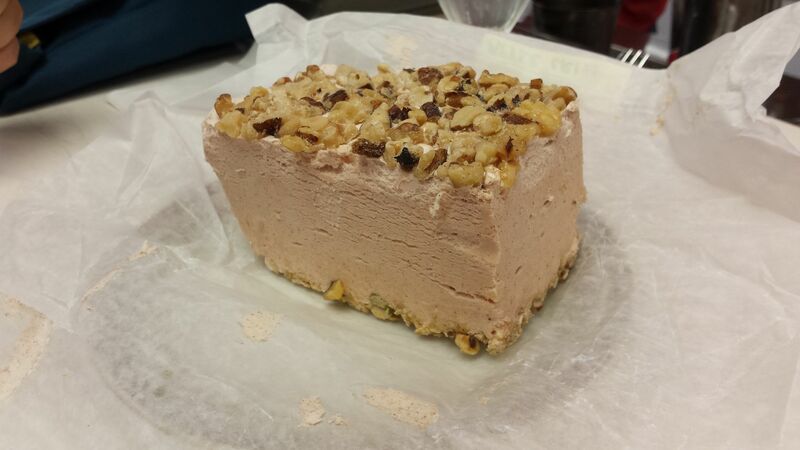 It's not a traditional ice cream sandwich in that there aren't cookies involved. But it's enormous. There must have been a pint of ice cream on there. I was impressed that my wife finished it. I went for a turtle sundae. The nuts are not visible, but are buried under the sauces. 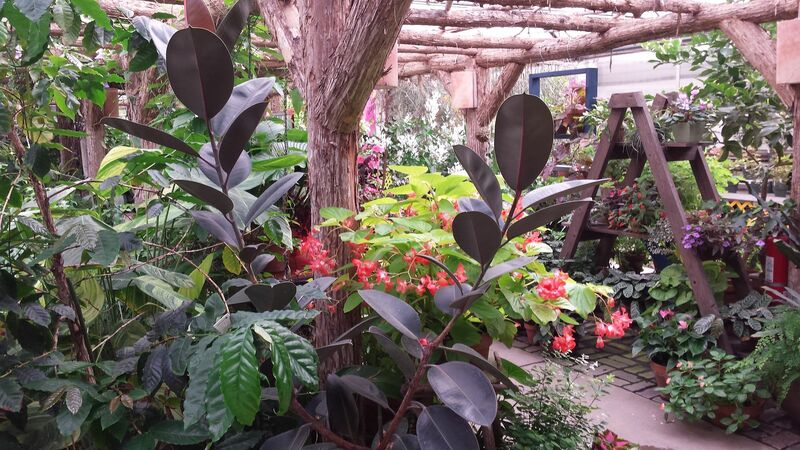 I'm not really a nature or flowers kind of guy, but my wife is an avid gardener and we usually hit the local botanical garden when we travel. The one in Des Moines turned out to be nicer than most. 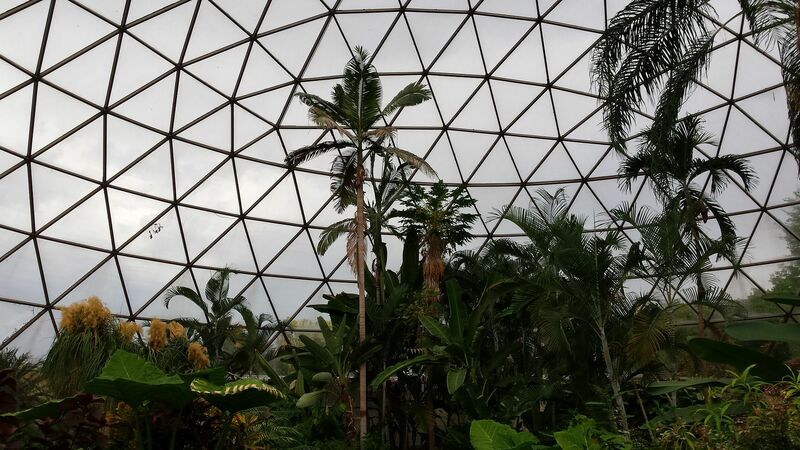 There is a lot to be seen under the glass dome and we took advantage of that, as it was raining when we arrived. I mentioned that we didn't have a major dinner planned for this night. 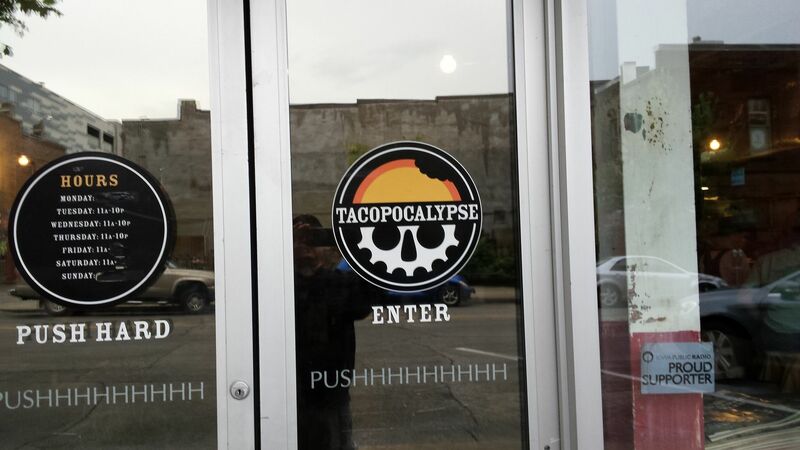 We again decided to stay near the hotel and found a place called Tacopocalypse a few blocks away. 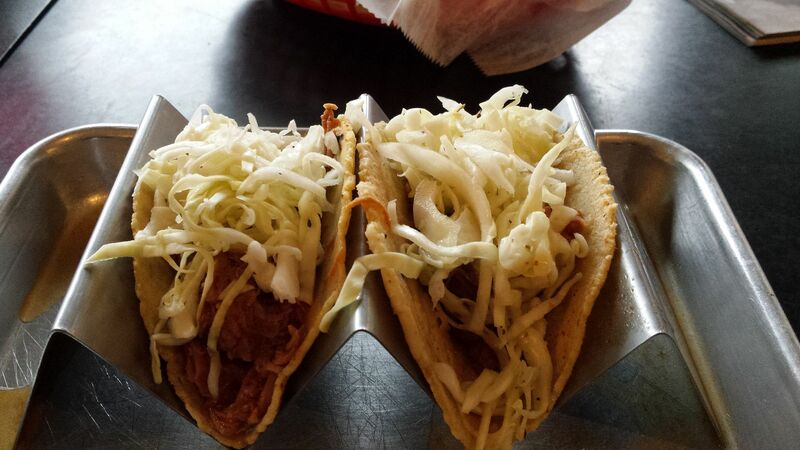 They are supposed to feature Asian inspired tacos, and I've seen such places in Philadelphia's Chinatown lately. But my braised pork tacos were pretty traditional Mexican food, and I enjoyed them. I wouldn't go out of the way for this place, but I wouldn't hesitate to go back there if I were staying in the same area again and needed a meal nearby. We were between the capitol and the Des Moines River. 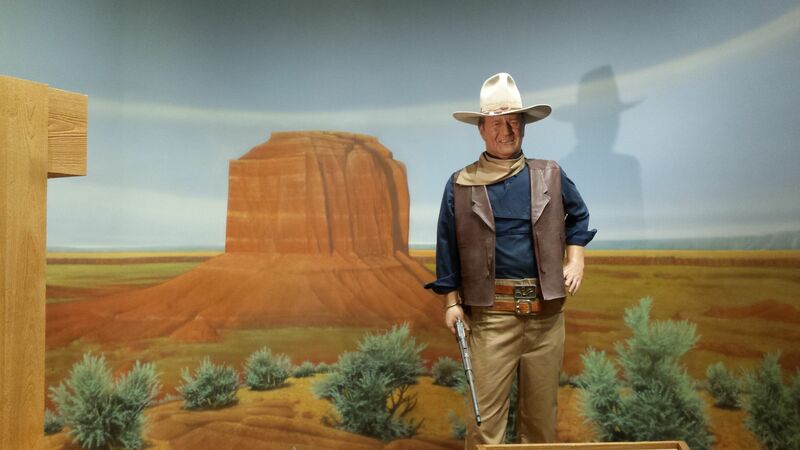 John Wayne? I was expecting Don Knotts! 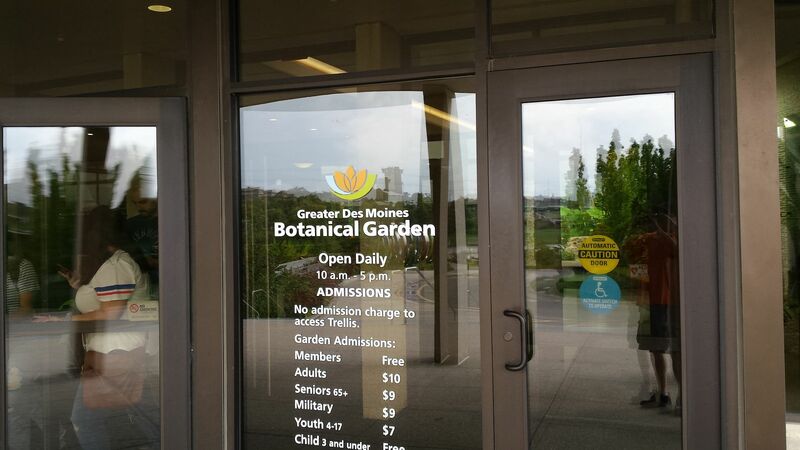 I haven't been to the Botanical Garden for many years, and your photos reminded me that I should try to visit it again the next time I'm in Des Moines. My wife and I took our kids there a couple of times and they really enjoyed it. I went through a big Western movies phase maybe 5-10 years ago. I'm now on a classic Western TV shows kick and am working my way through every Gunsmoke episode. 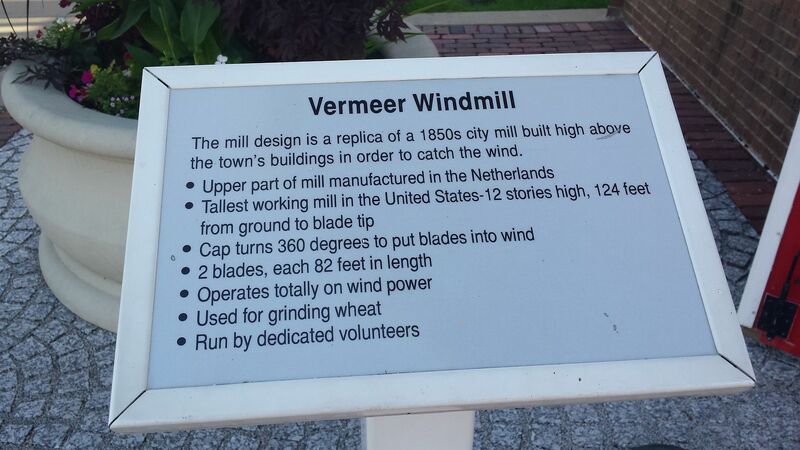 If James Arness was from Iowa, I'd have looked into any related tourist attraction. I think he's from Minnesota. We'll eventually get there. 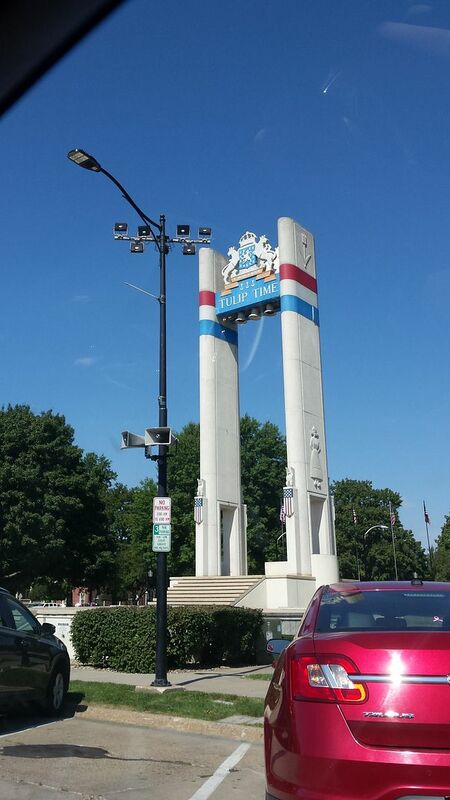 Actually, for baseball fans, especially Cleveland Indians fans, I'll mention that we drove past a highway marker for a Bob Feller museum in I assume the town where he grew up, which was a little west of Des Moines. It was too late to stop on our final evening of the trip, so we missed it. My father-in-law grew up in Cleveland and is a huge Bob Feller fan, to the point where he dragged the family on a side-trip to see the house in which Feller lived when he played for the Indians. 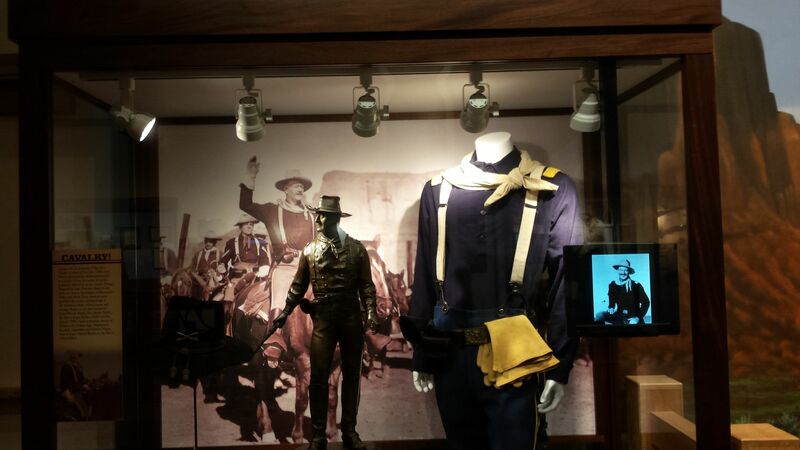 If we had known about this museum in advance, we'd have definitely planned on stopping and picking up something for my father-in-law if they had a gift shop. I'm now on a classic Western TV shows kick and am working my way through every Gunsmoke episode. 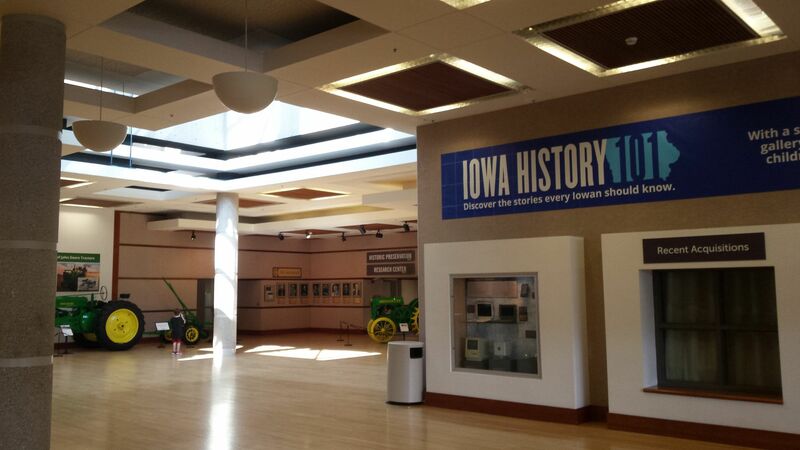 If James Arness was from Iowa, I'd have looked into any related tourist attraction. I think he's from Minnesota. We'll eventually get there. Are you sure? That sounds like it could be an impossible mission, but if you do get there I recommend going by airplane. I'm almost through season 17. Only three more to go! Great report. Once, on a recording, I heard a hilarious Abbott and Costello routine concerning Bob Feller. I can't remember just how it went but it was some confusion about which 'Feller' was Feller. Probably put into a baseball routine with 'Who's on First". You might look for it. I don't know how to do a link but I found the Feller routine. Hysterical. Googled Abbott and Costello Bob Feller. Thank you. Read what Wikipedia had on Feller. Phenomenal player and seemed like a good, decent person. 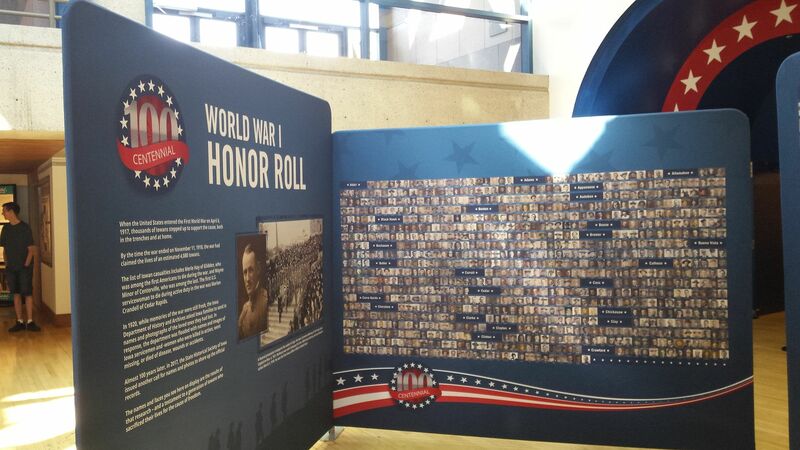 The following day, Wednesday, we left Des Moines in the morning and headed northwest, taking state and U.S. roads and highways the entire time. 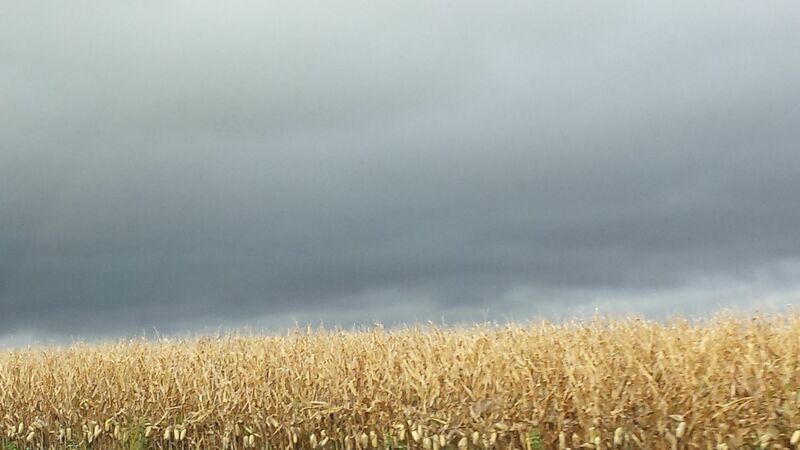 This was unquestionably a day when I saw more cornfields than any other in my life past and probably future. We were in the car close to five hours and that was the dominant scenery probably 80-90 percent of the time. I actually enjoyed it. It's fun to see different regions of the country, especially with the way the culture of the coasts has changed. It looked like we might get caught in a bad storm, but it didn't happen. 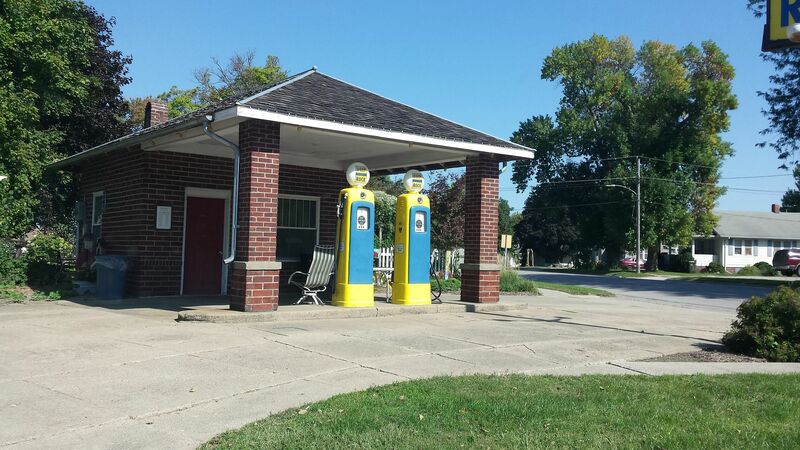 We wound up on the Lincoln Highway for a relatively brief portion of the ride. I had one food stop planned for the trip. It was a late addition due to the change in plans I mentioned in the last installment of this report. 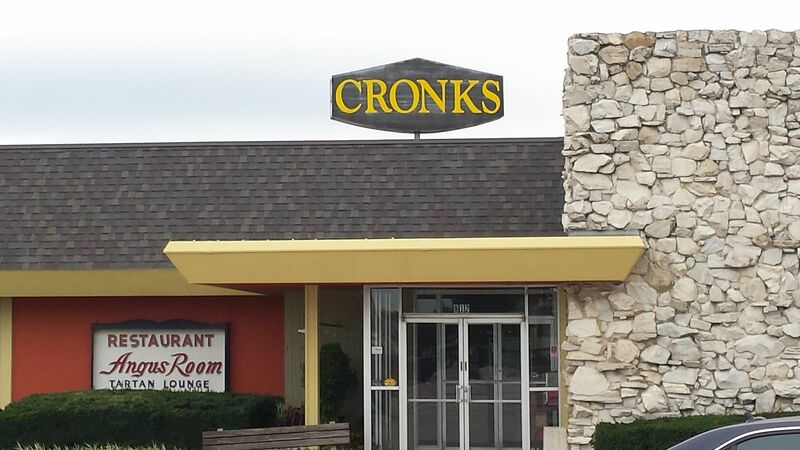 The very old Cronks in Denison was only a slight detour from our route. 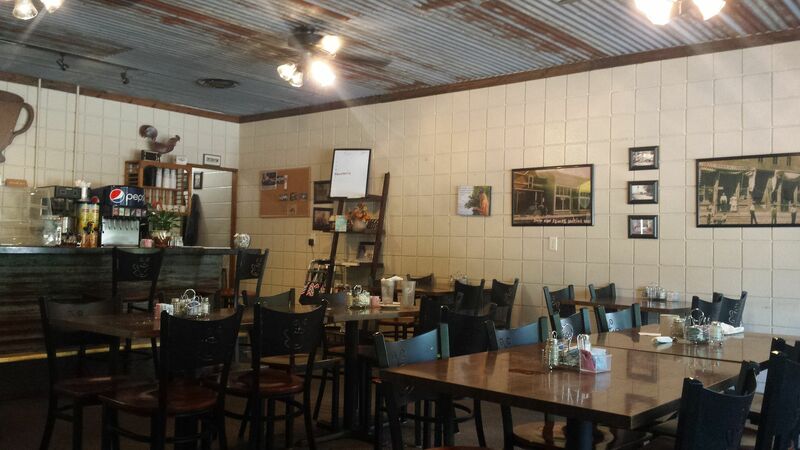 I had initially intended it to be just a pie stop as I read good things about their pie. 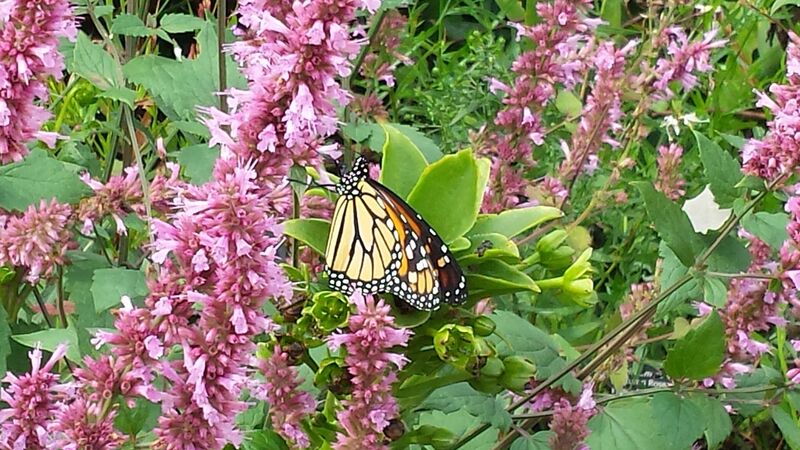 But I decided to have lunch there too. 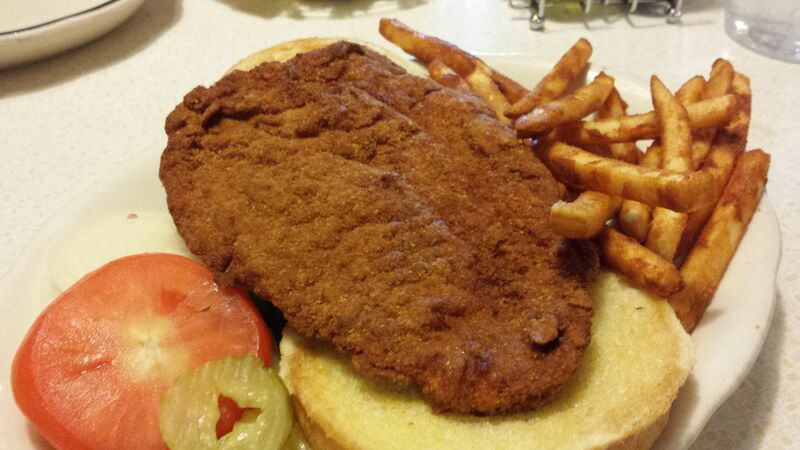 I felt some pressure during the early stages of planning for this trip to include at least one breaded pork tenderloin sandwich given how significant they are in Iowa. But I've had two or three of them in Indiana and while I don't dislike them, they don't excite me either. I'd much rather have a good burger. 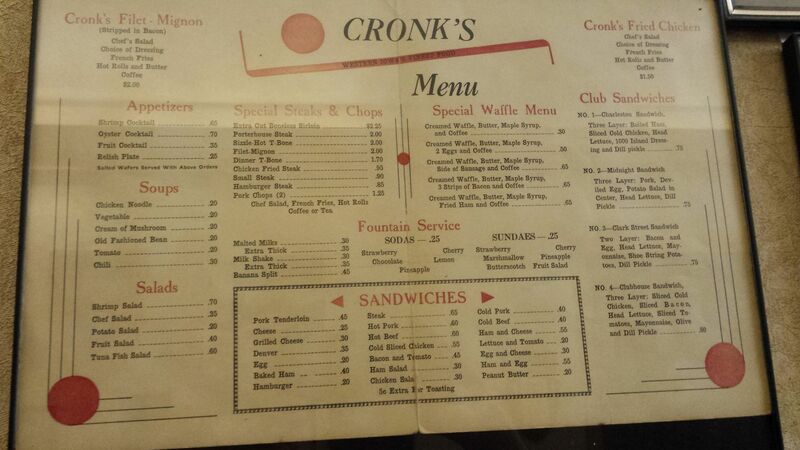 After deciding it's okay if I skip a BPT on this trip and even resigning myself to the likelihood that I would do that, I recalled while in the car that the review for Cronks on this site includes a photo of a BPT, so I decided to order one. The fact that it was relatively small by Iowa BPT standards was a plus for me. It was not a great BPT, but not terrible either. It was a little on the dry side, but not extremely so. I'm glad I had one when I was there and doubt that having a great one would have made much of a difference to me. 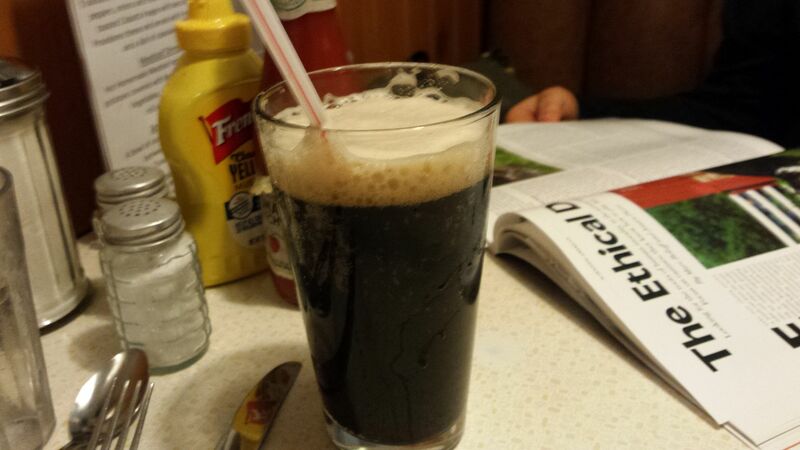 They served Crown Point root beer at Cronks, which I was unfamiliar with. But it's very good. I was again disappointed that in spite of having a large pie selection, with a board divided into categories (fruit and cream), they didn't have butterscotch pie and again chose to go with a fruit flavor, this time peach, which I had also been craving lately (I think the fact that the cream pies at the Coffee Cup were so good kind of ruined the standard cream flavors for me for the rest of the trip). 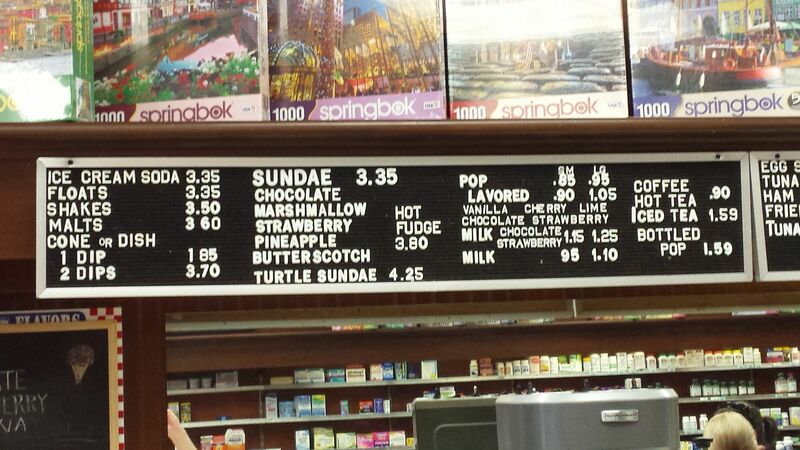 They had something called raisin pie listed with the cream pies on their board, but it didn't mention sour cream. I'm not sure if it was the same thing. Regardless, I was only having one slice of pie and wanted to make sure it was a flavor I'd like. I chose wisely, as the peach pie, which I had warmed up, was very good. 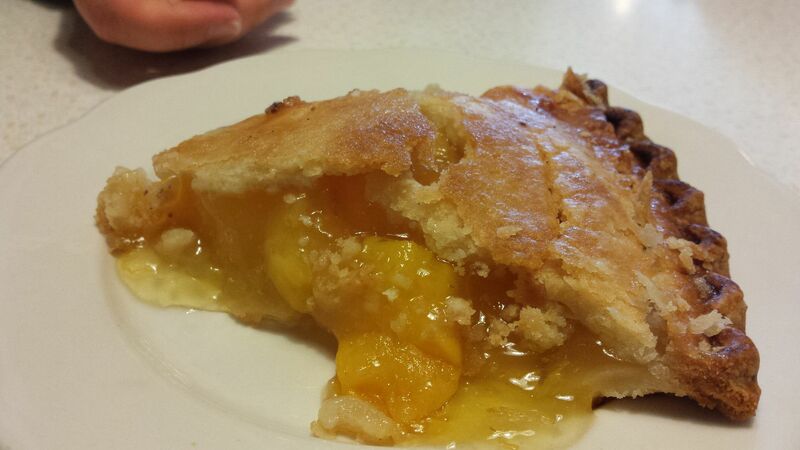 The crust had a nice buttery quality to it and there were plenty of peach slices in the filling. I was very satisfied after eating it. After leaving Cronks, we headed to our main destination: Le Mars. After checking into our hotel, we drove downtown and walked around a bit. 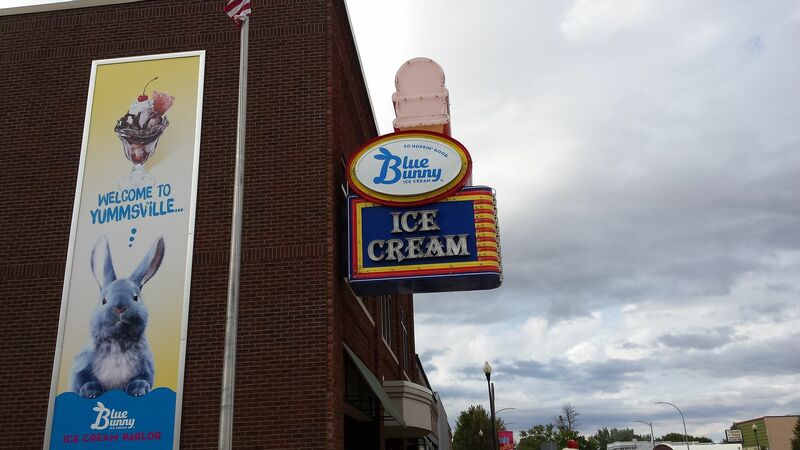 While we were there, we went into the Blue Bunny old-fashioned ice cream parlor just to check it out. It's a very nice place. 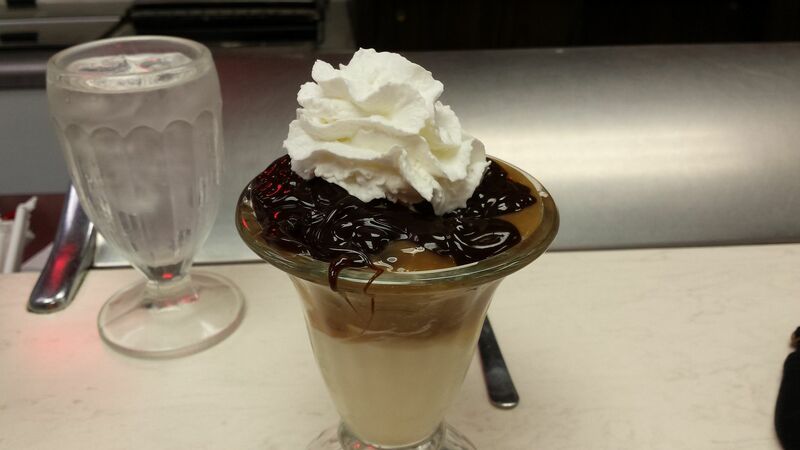 I watched a couple sundaes get made, but we were about to go to dinner, so we didn't have anything. Unfortunately, downtown Le Mars has probably seen better days. Although I didn't photograph it, one side of one block was full of mostly boarded up or abandoned-looking former businesses. It was sad because on the side of the building at the end of that block are a series of photos of Le Mars in its heyday during the first half of the 20th century. Other stretches of downtown looked better. But the overall feel wasn't good IMO. 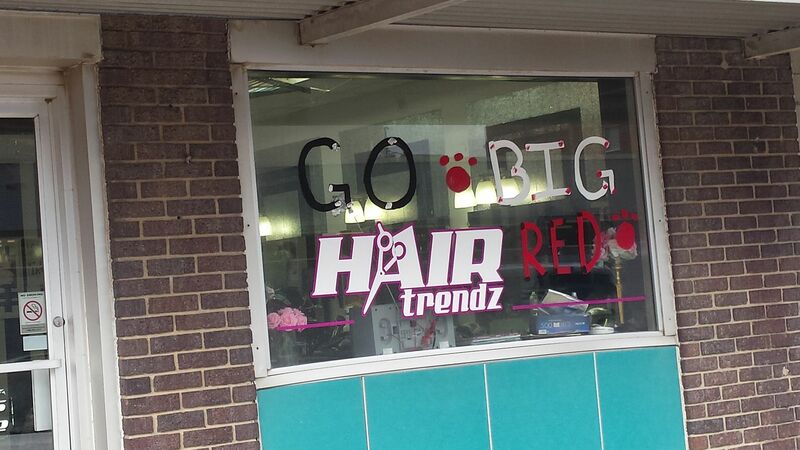 The best sign that there was still community spirit was the abundance of hand-written or pasted messages on store windows in support of the local high school football team. With regard to Le Mars billing themselves as the Ice Cream Capital of the World (they have large ice cream cone sculptures all over town), I'd guess I'm not alone in thinking that's a stretch if they're basing it on nothing other than being the home of Blue Bunny, and I couldn't find anything else there in the way of ice cream or ice cream production. It all seemed to be related to Blue Bunny. I guess it's a marketing slogan and a way to try to draw tourists. I didn't get the impression it's working, although it's tough to tell on my limited experience. It had nothing to do with why we were in Le Mars. One of the two main reasons, and the main reason for this day, was our second steakhouse dinner, obviously at Archie's Waeside. I was very surprised upon arriving at Archie's for a couple reasons. 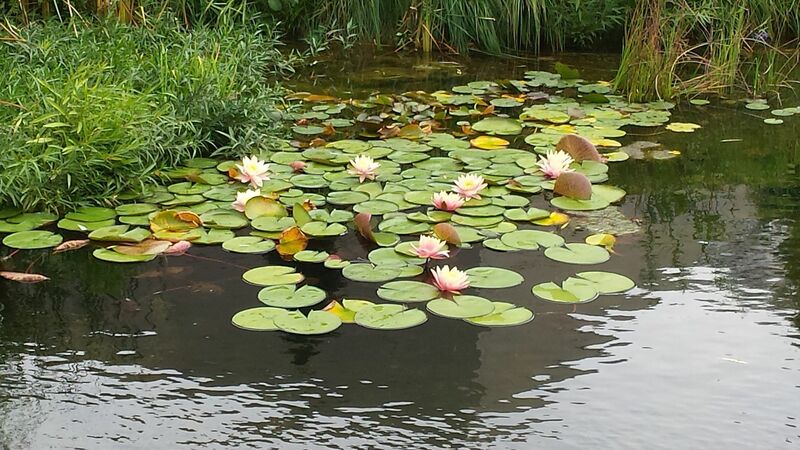 First was the setting surrounding it. 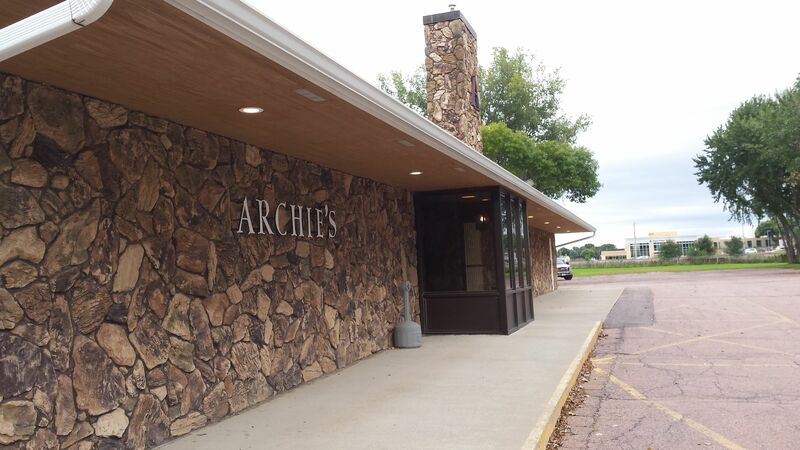 Archie's is a few blocks outside of downtown, literally on the other side of the railroad tracks. From the condition of the houses near it and it's the general setting, it's the last place I'd expect to find a steakhouse like Archie's. Although given what I've read about the original Doe's in Mississippi, I should probably let go of that notion. I'm bound by my past experiences. The other surprise was the size of the place. At first glance, I thought Archie's was part of a strip of several businesses, but it turned out that the entire, very long building was all part of the same operation. There was a large meat truck making a delivery when we pulled in. They must have their dry-aging room, handle their mail-order business and all kinds of other things in the extra space. We were again among the first guests. 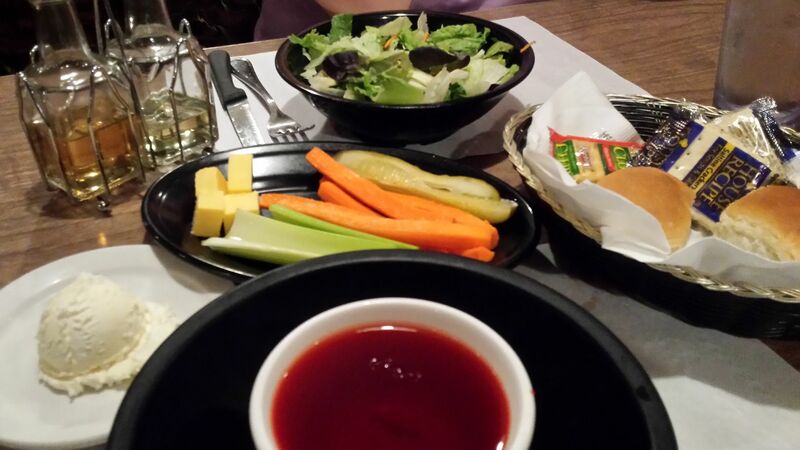 We had our first relish tray at Archie's. It's not comparable to the one at the Redwood Steakhouse, but I was still pleased with it. The red stuff is jello. 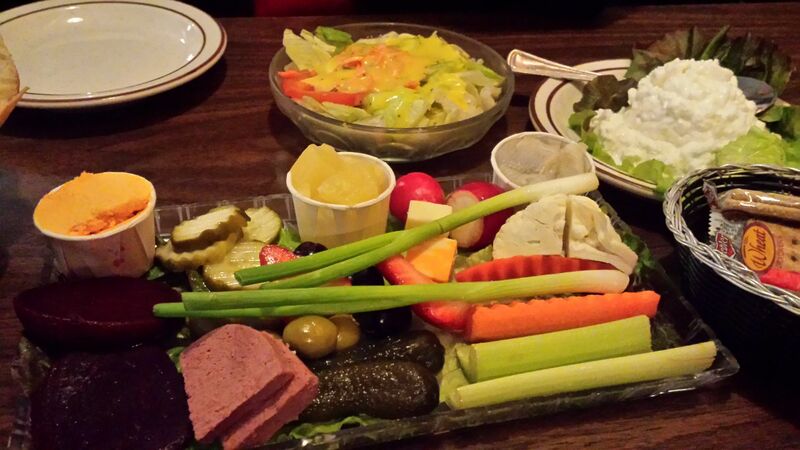 I again asked to skip the salad and was offered cottage cheese or jello as an alternative. The waitress laughed when I complimented how the jello was presented. 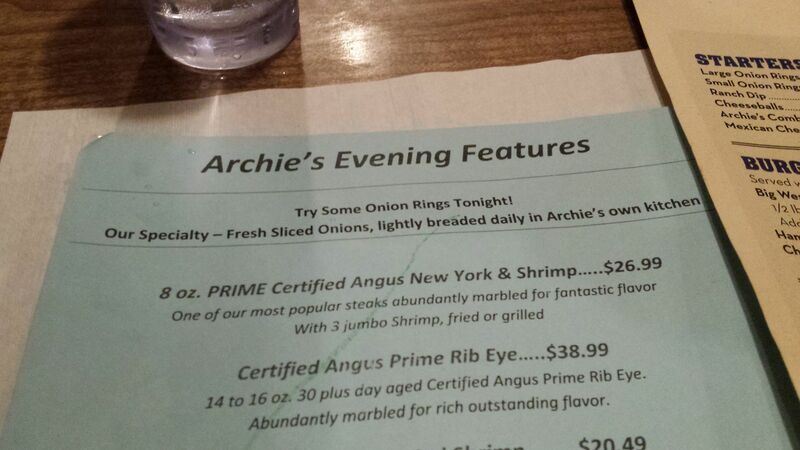 I had initially planned on getting another ribeye at Archie's. But they had specials and one caught my eye. I liked the idea of having fried shrimp with my steak and was willing to have the New York Strip instead of the ribeye because it was Prime. I'm guessing anything that isn't specified is Choice or maybe Angus/Choice. I didn't mind the smallish steak because of the addition of the shrimp. It worked well. 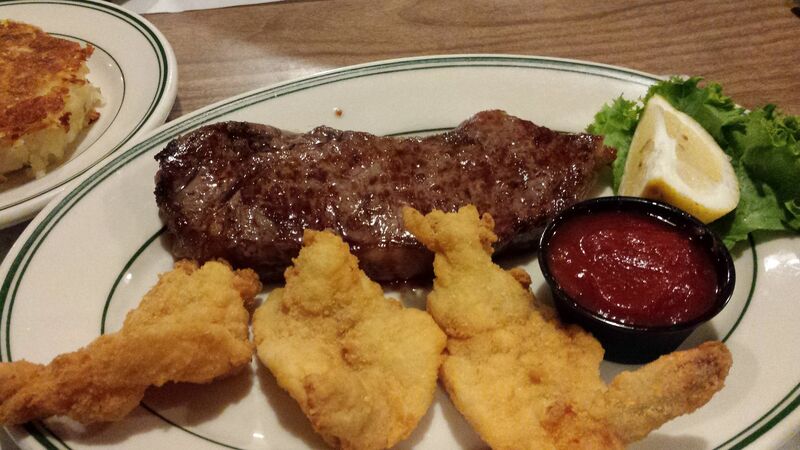 The steak was excellent and I enjoyed the shrimp. I had hash browns on the side. My wife had some kind of chicken with sautéed mushrooms in addition to her baked potato. While there were only three shrimp. as you can see, they were very big. I hope you enjoyed your hashbrowns. That looks like a really good plate you were served. 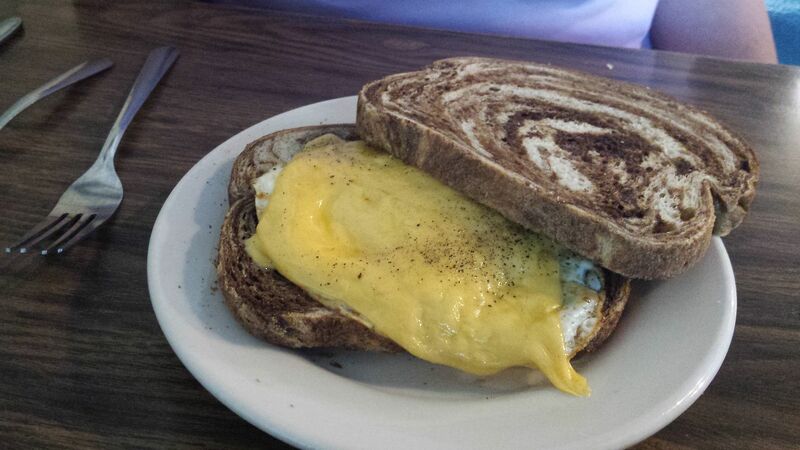 They're a supper club staple in the Midwest. 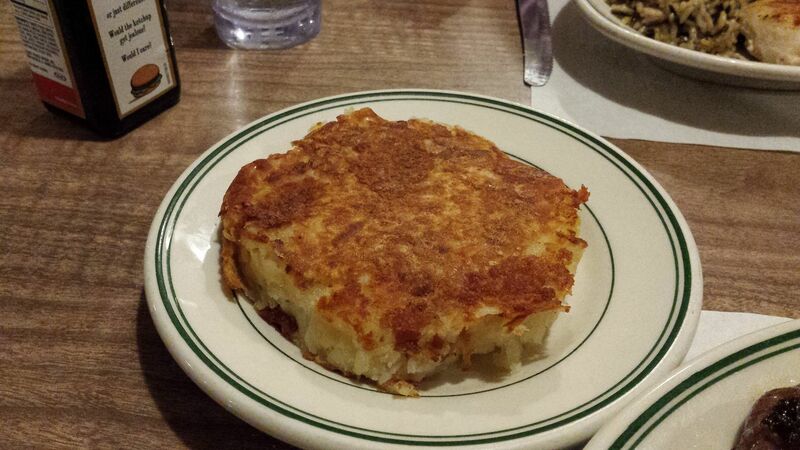 Do you see hashbrowns offered in the East at steakhouses? It's not that unusual. I know at least some of the upscale steakhouses in Philadelphia offer them, sometimes gussied up with extra stuff. 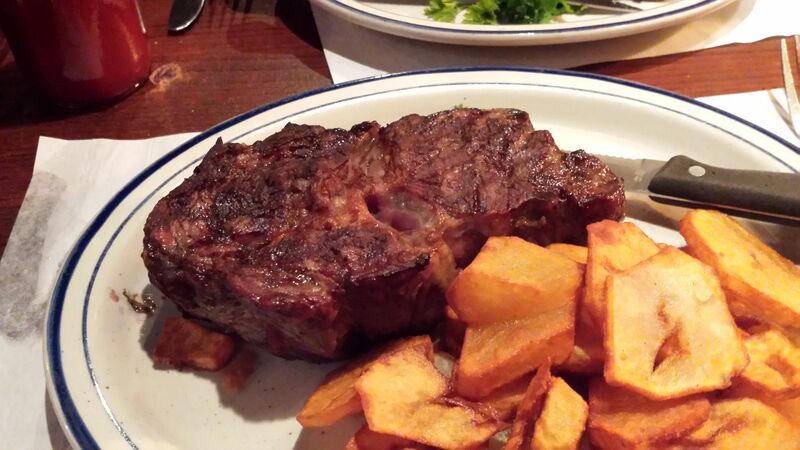 Although those steakhouses almost all charge separate for potatoes and any other sides. Nothing comes with the steak. The difference in price between a good steakhouse here and the supper club type steakhouses out there is massive. What did stand out to me was how popular onion rings are as a steakhouse appetizer in that part of the country. I generally just think of them as a substitute for fries with a burger. On further review of some of my local steakhouse menus, while it's not unheard of to see hash browns offered as a potato option, it's definitely less prevalent than in the area where I just visited. I think the fact that I've gotten them at one steakhouse in Philly that I like stood out in my mind. I like having them as an option. Mrs. Maestro could've gotten that 'do at Hair Trendz if you'd planned ahead. 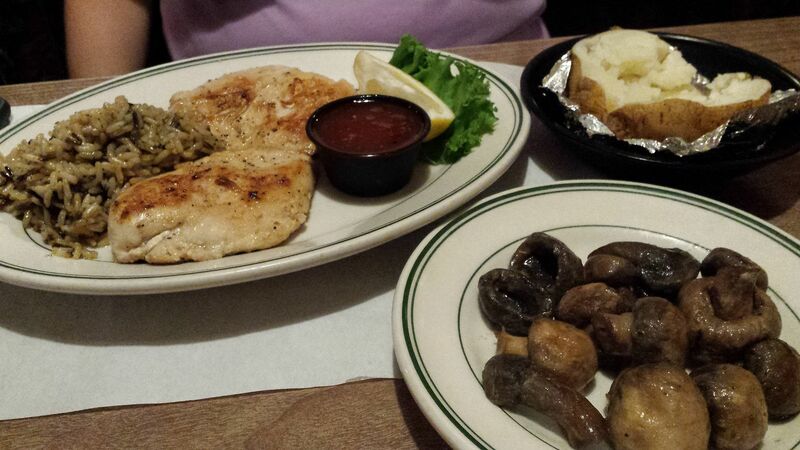 My wife had some kind of chicken with sautéed mushrooms in addition to her baked potato. Exactly the proper way to describe a non-steak entrée ordered at a steakhouse! Looks like you made an excellent choice. 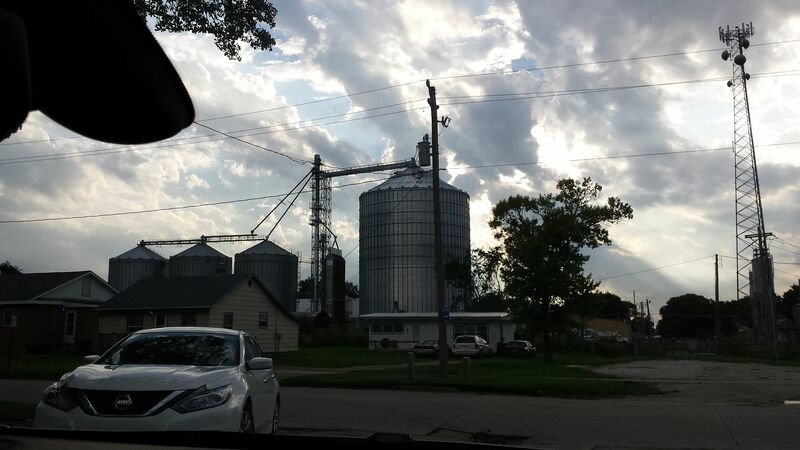 One of LeMars' tallest buildings? 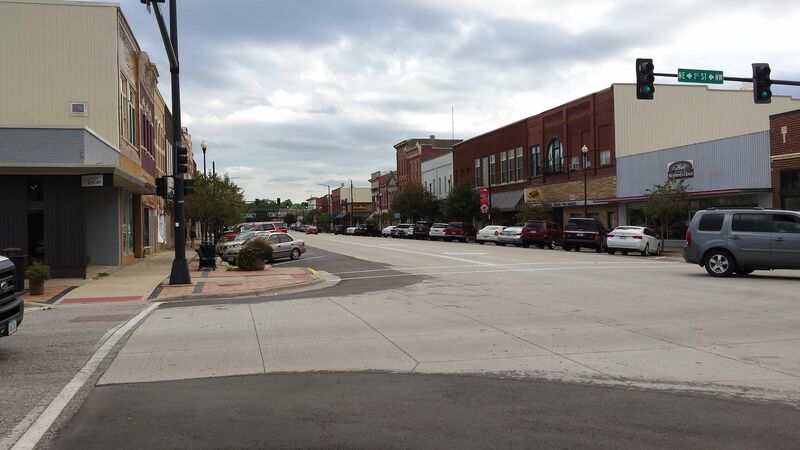 Your description of Main Street unfortunately applies to far too many small towns, both in the Midwest and elsewhere.